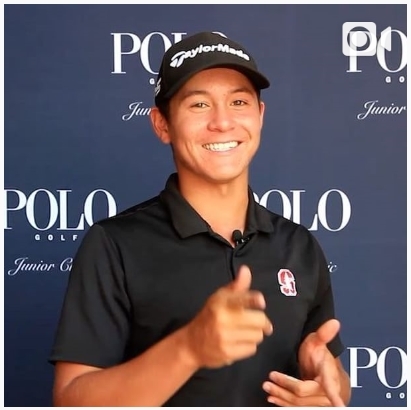 Karl is a 17-year-old junior golfer who studies and plays in the US and is committed to represent Stanford University when he graduates in 2020. 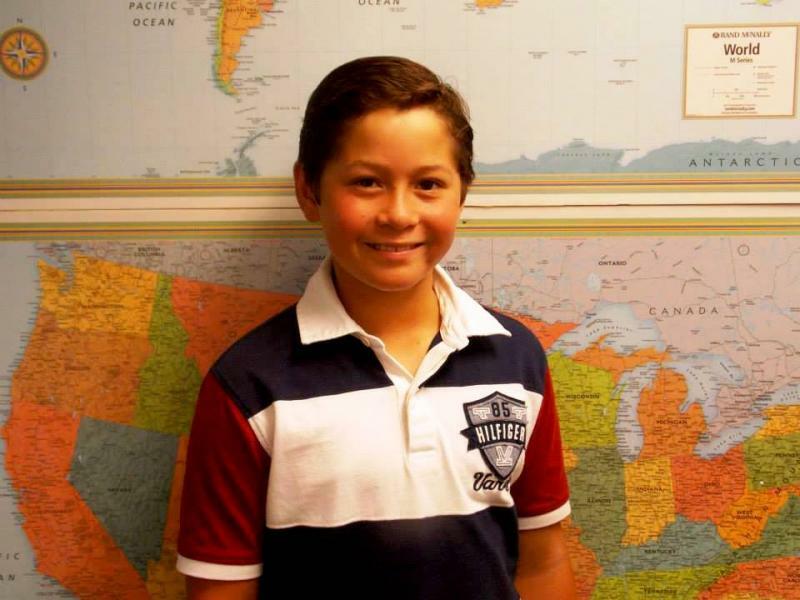 He is an Australian Citizen, but has been studying in the US on scholarships since the age of 11. 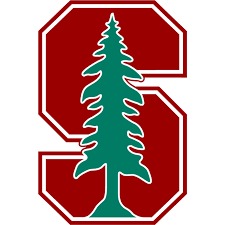 To fulfill his academic requirements so as to be able to honour his committment to attend Stanford University commencing 2020. To allow Karl to realize his potential, whatever that may be. Hi, I'm Karl's Dad and have maintained this website as a form of scrapbook (if you like) since Karl was just 7 years old. 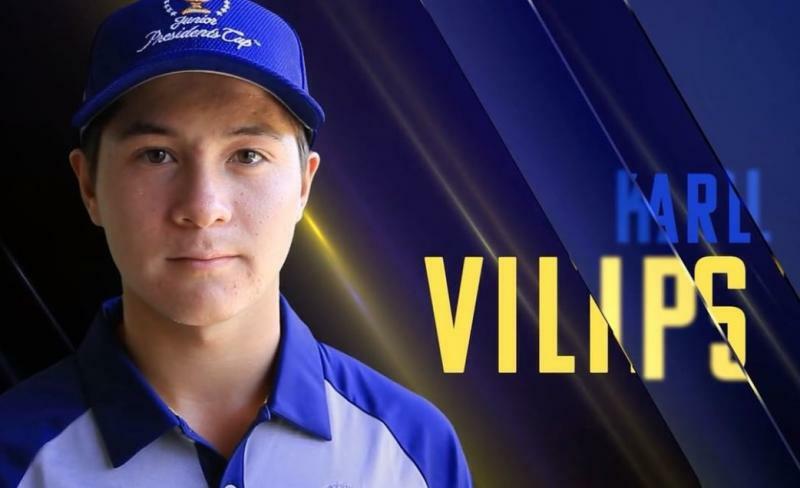 It has allowed suporters to join Karl on the journey that he's been on and to get behind him by funding his otherwise improbable odyssey to now see him having represented Australia at the 2017 Junior Presidents Cup and having the Boys Gold Medal at the 2018 Youth Olympics. Additionally, it was due to this website and his accompanying YouTube page that Karl was offered scholarships to live and study in the US since he was just 11 years old and to eventually go on to receive an offer of a full scholarship to Stanford University. It's amazing how it's opened doors for Karl which we could never have imagined. Now that Karl's 17 years old and not a kid anymore, it's tempting to close this website down but having done so for a trial period it appears that there are many people out there who are interested keeping this page public and as such, we'll keep this website current for as long as you keep being interested. Feel free to email us with any comments, questions or words of encouragement for Karl to us at pauls@westnet.com.au. 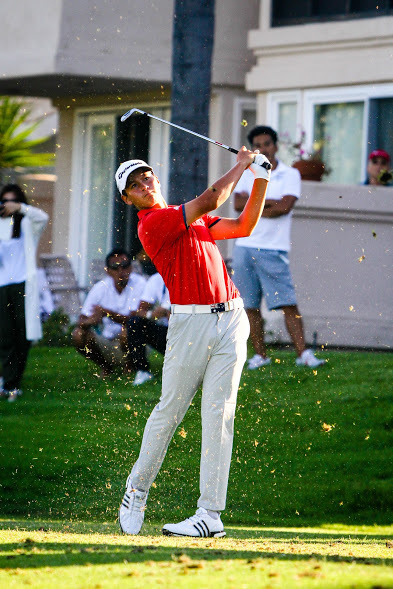 #1: Rolex National Junior Rankings for players not yet in University (12-19 years). Full rankings here. #38: R & A World Amateur Golf Ranking for Male Amateurs Worlwide. Link to world rankings here. 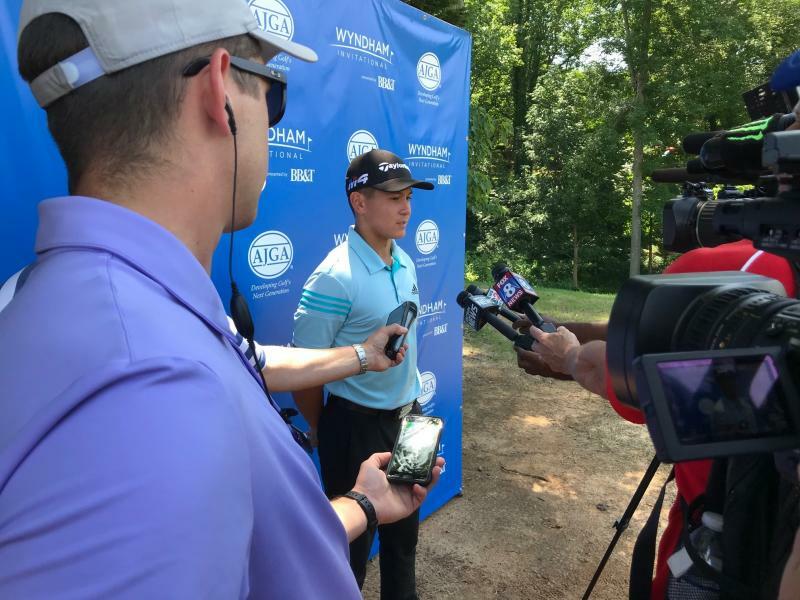 The AJGA Wyndham Championship, where his 6-shot win featured a course record equalling 62 on the Pete Dye course at the Sedgefield Country Club in Greensboro. That score was just 1 shot shy of the all-time lowest score in the AJGA. 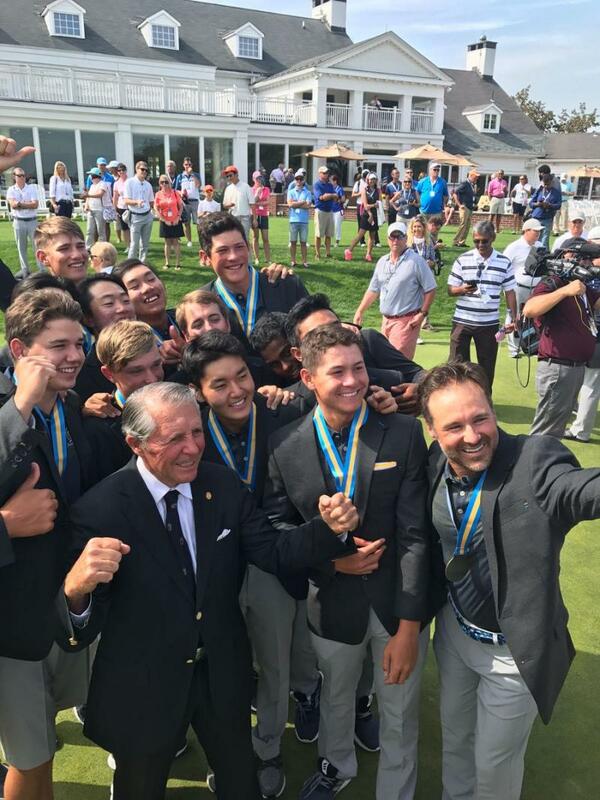 The Youth Olympics Gold Medal for boys in Buenos Aires, Argentina, where be Birdied 4 of the final 6 holes to clinch the win. Earned Rolex All American Honors for the 4th straight year, sitting just 1 honor behind the 5-time honoree, Justin Leonard as most Honored. Named to the 2018 TransAmerica Scholastic Honors Roll, reflecting his balance of academic excellence and golf achievements. Winning the Wyndham Championship saw Karl chalk up his 5th AJGA title, but more importantly he joined an illustrious list of players who have shown amazing consistency by winning every year. Karl now sits just year short of Phil Mickelson's 5 straight year winning streak and has 2 season's remaining in the AJGA. 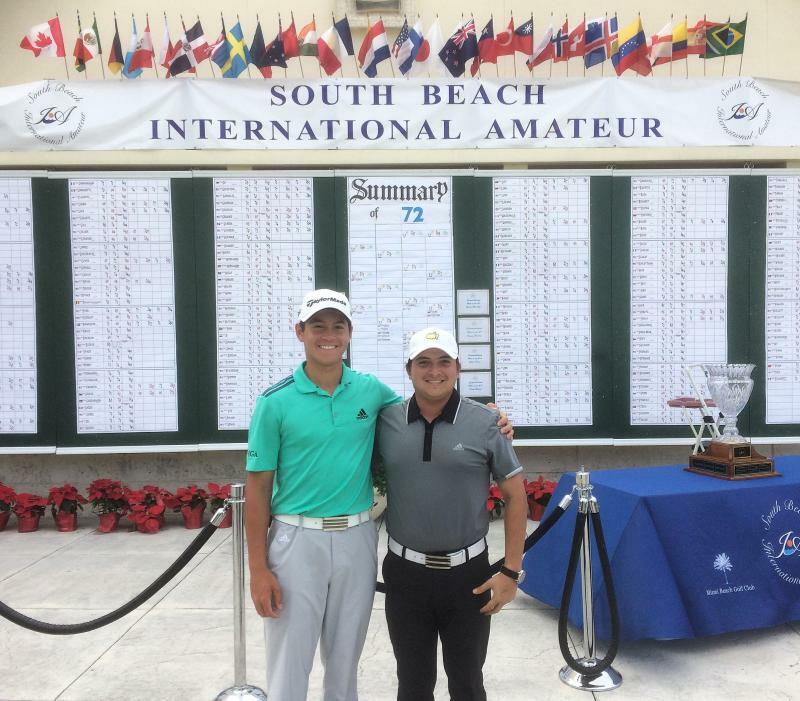 2018, 22nd December.10th place in a field of over 200 players at the Men's South Beach International Amateur in a field of predominantly College and international players. Scores here. 2018, 17th November. 3rd. Karl finishes 3rd at the AJGA's Rolex Tournamrent of Champions at PGA National Resort and Spa in Palm Beach Gardens, Florida. Scores here. 2018, 14 October. Gold. Karl wins the Gold Medal for Australia at the 2018 Youth Olympics in Buenos Aires, Argentina. Story here. 2018, 19 July. Tied 2nd in stroke Play at US Junior Am. 2018, 21st June. Runner-up- Western Junior Open. Results here. 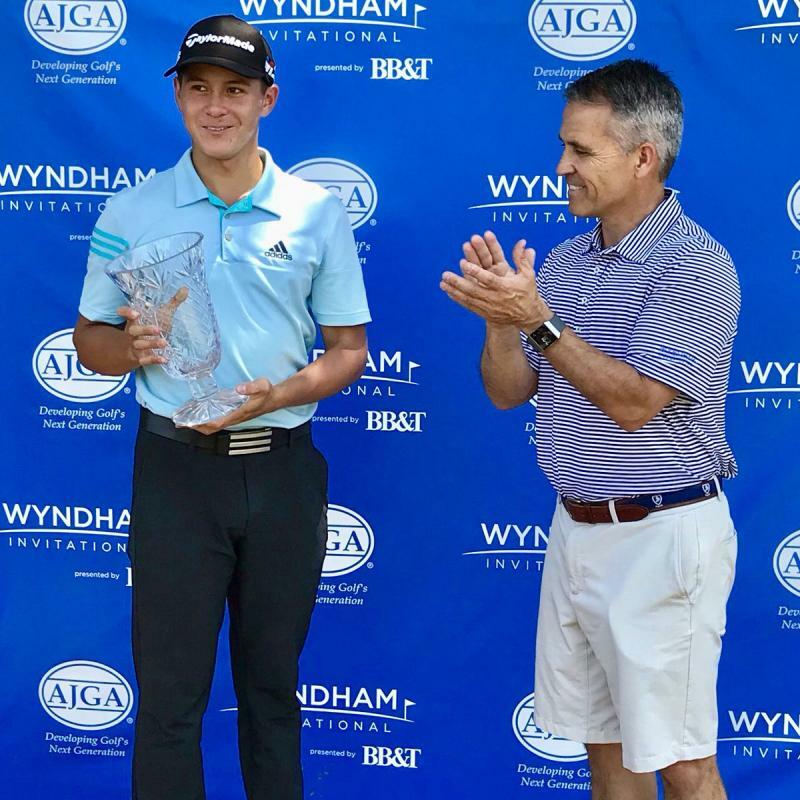 2018, 15th June: Winner- the AJGA's Wyndham Championship. 2018, 14th June: 62- competitive course in the 3rd round of the Wyndham Championship. Link here. 2018. 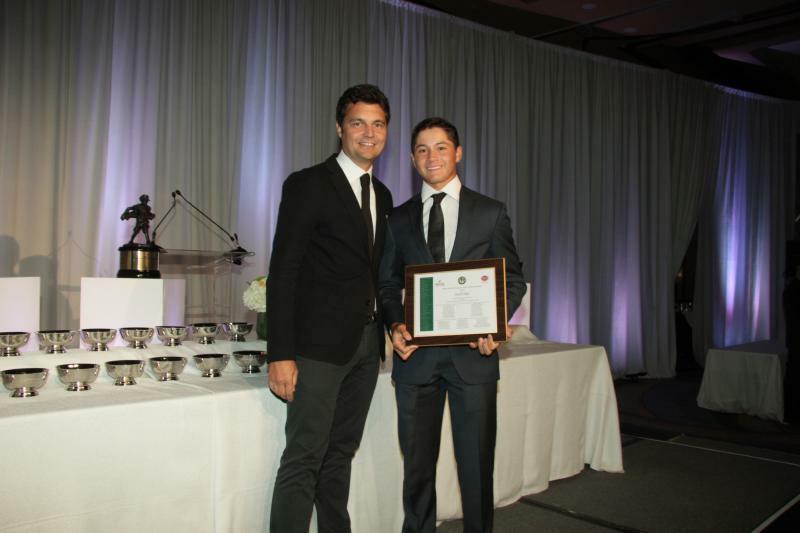 1st June: Ascended to the #1 ranking in the Rolex Junior Rankings for all boys yet to start college. 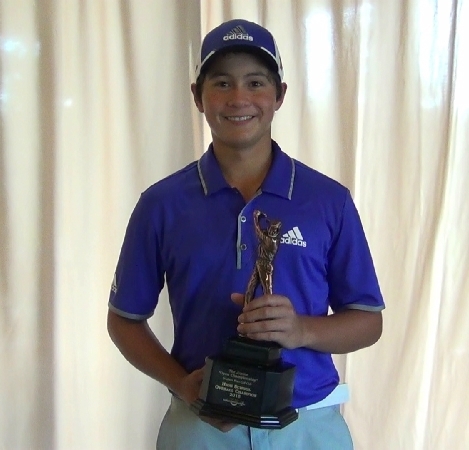 2018, age 16: 3rd, AJGA Thunderbird International. Results here. 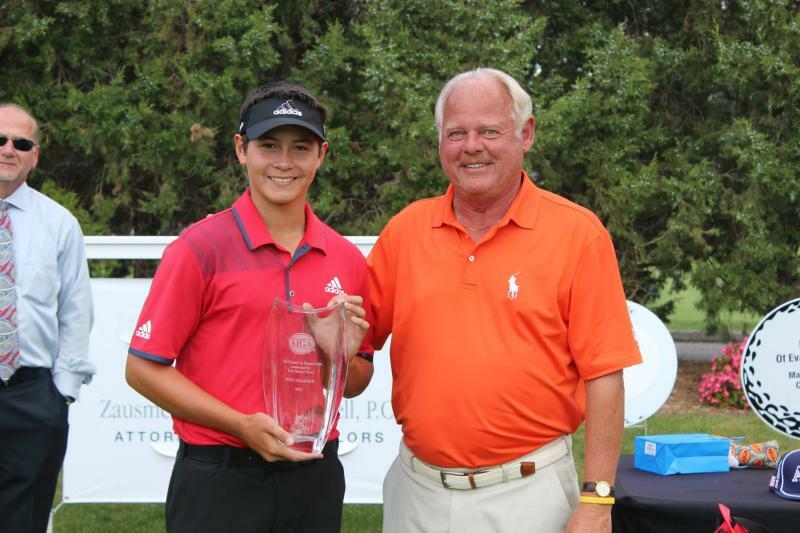 2018, age 16: 2nd, AJGA's Bishopsgate Junior Championship. Results here. 2018, age 16: 15th, Australian Master of the Amateurs. Results here. 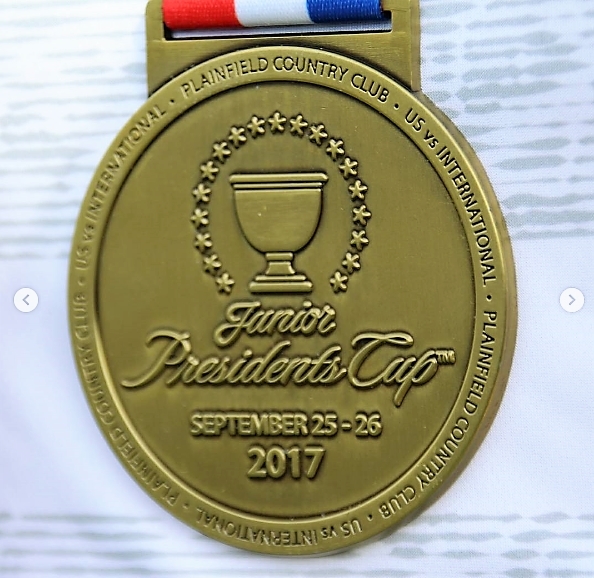 2017, age 16: Junior Presidents Cup- Represented the International Team and won his Singles match. Link here. 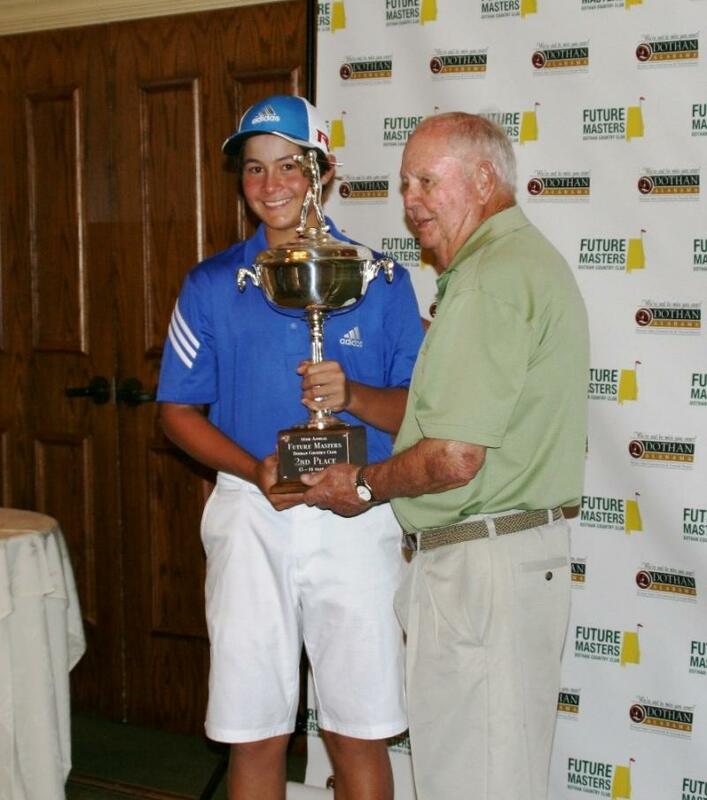 2017, age 15: Winner, Southern Amateur (equalling Bobby Jones as youngest winner). Link here. 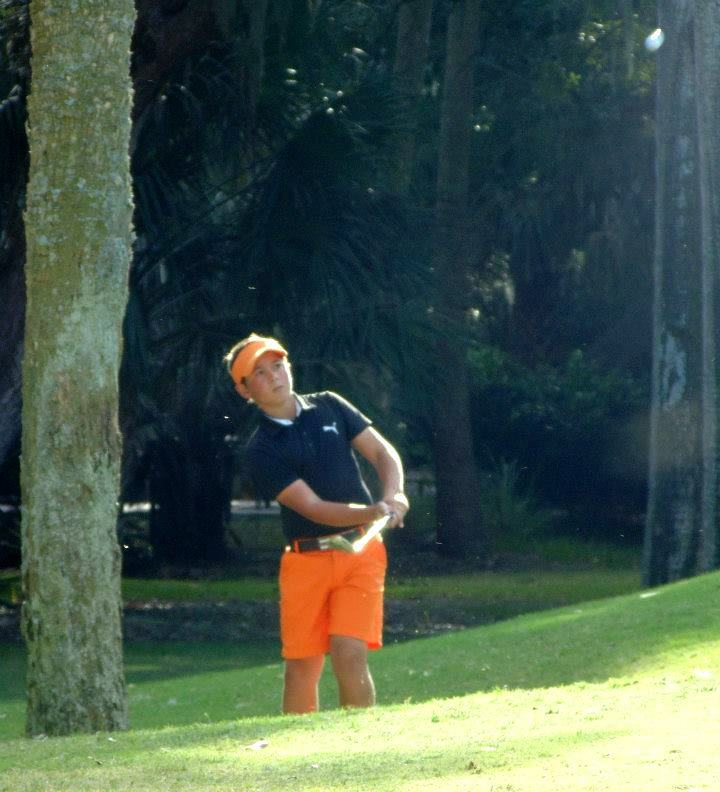 2016, age 15: Winner, Junior Orange Bowl (Youngest ever winner). Link. 2016, age 15: Named to the 2016 Rolex Junior All-American 2nd Team. Link. 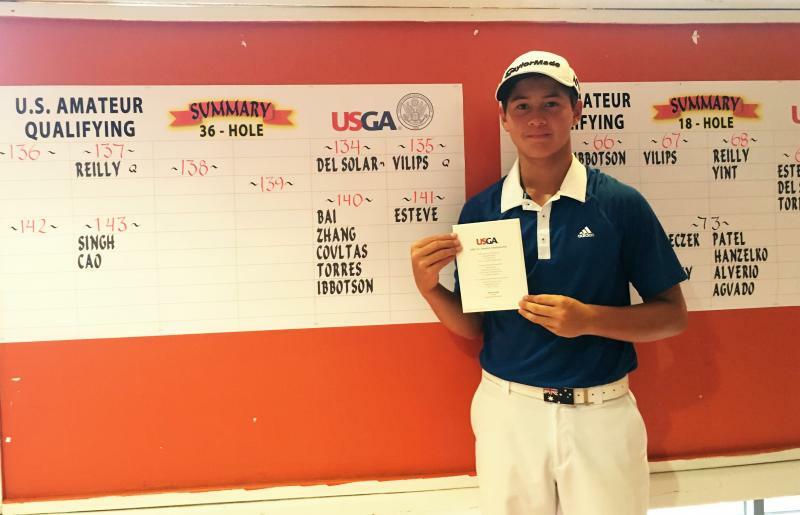 2016, age 14: Qualified for the US Amateur, results here. 2016, age 14: Karl burst into the Polo National Rankings at #9, becoming the first Middle School player to do so. 2016, age 14: Tied 3rd at Haas Family Invitational, new overall Polo Ranking is 17. 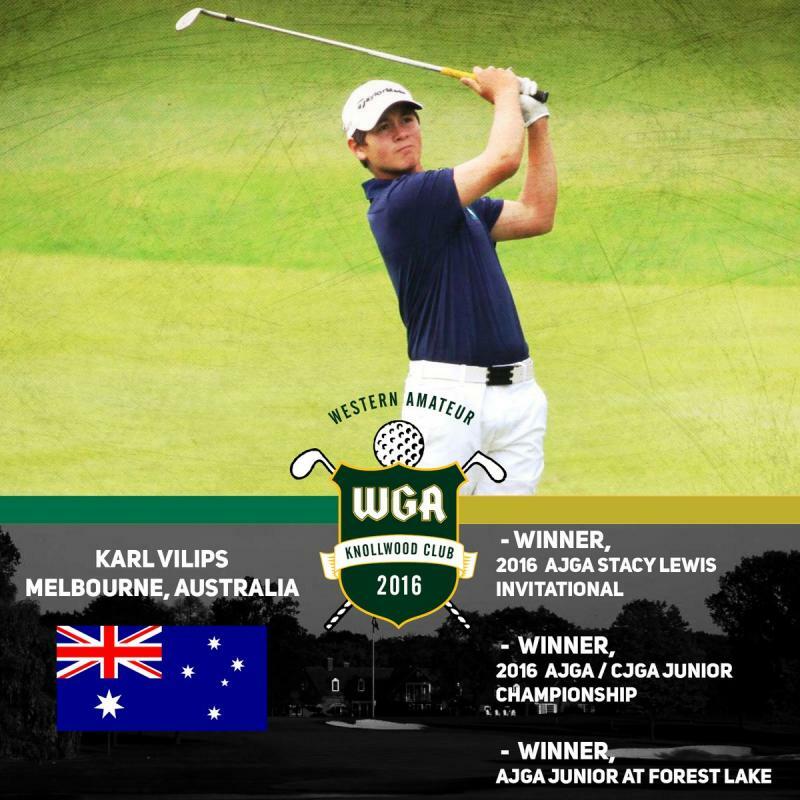 2016, age 14: Karl finishes 46th in the Level 1 World ranked Mens Australian Amateur. 2015, age 14: Karl reaches # 1 nationally for 2020 Graduates on the Polo rankings. 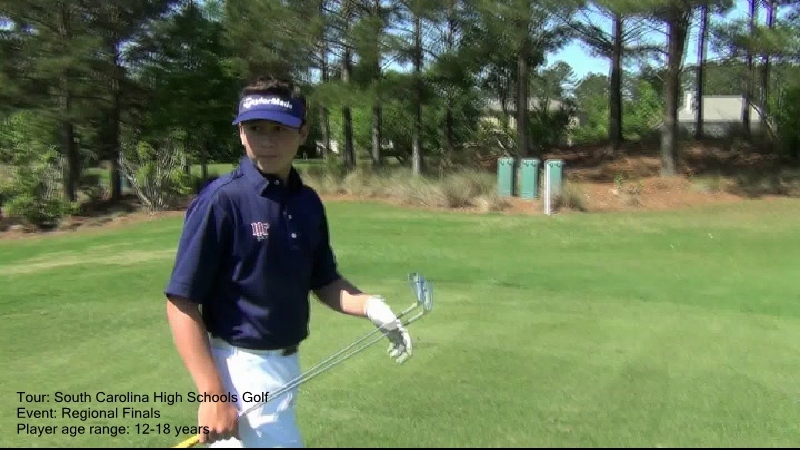 2015, age 14: Karl reaches # 32 for Boys age 18 & under on the Polo Golf rankings. 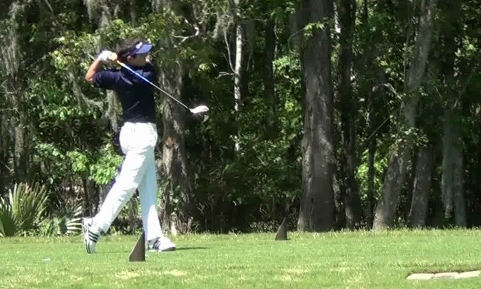 2019, 18th February: T2nd, AJGA Simplify Boys Championship played at Carlton Woods in Houston,Texas. Karl comes from 3-behind with 5 to play in the final round to force his way into a playoff where his repeated Pars on the 18th eventually weren't to combat a Birdie from Jackson Van Paris. The 2nd place did however, see Karl ascend to the #1 spot on the Rolex Boys Rankings, which he briefly had top spot of last year, making him the #1 Junior in the US. Full tournament details can be found here, and scores here. 2018, October 22. Gold Medal. 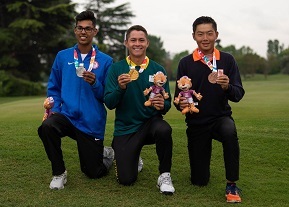 Karl comes from behind and birdies 4 of the last 6 holes to win the Individual Boys Gold Medal at the Youth Olympics. Video of Karl's highlights and the Gold Medal presentation ceremony can be seen here. As Australia's highest ranked boy between the ages of 14 & 18, Karl earned selection to represent Australia at the 2018 Youth Olympics to be played in Argentina in October. Media Story here. 2018, July 23. US Junior Amateur. After finishing Tied 2nd in the Strokeplay section of the tournament with rounds of 66 & 69, Karl was eventually ousted after the 2nd round of Matchplay and will give this title another shot in 2019. Equalling the competitive Course record with a 62. Having the 3rd best 54 hole total in the AJGA's 40-year history with scores of 67, 68 & 62 for the first 3 rounds. Karl's 62 has only been bettered by 61's on 5 occasions these past 40 years. Karl now sits behind only Bob May and Phil Mickelson in terms of consecutive years with a win. 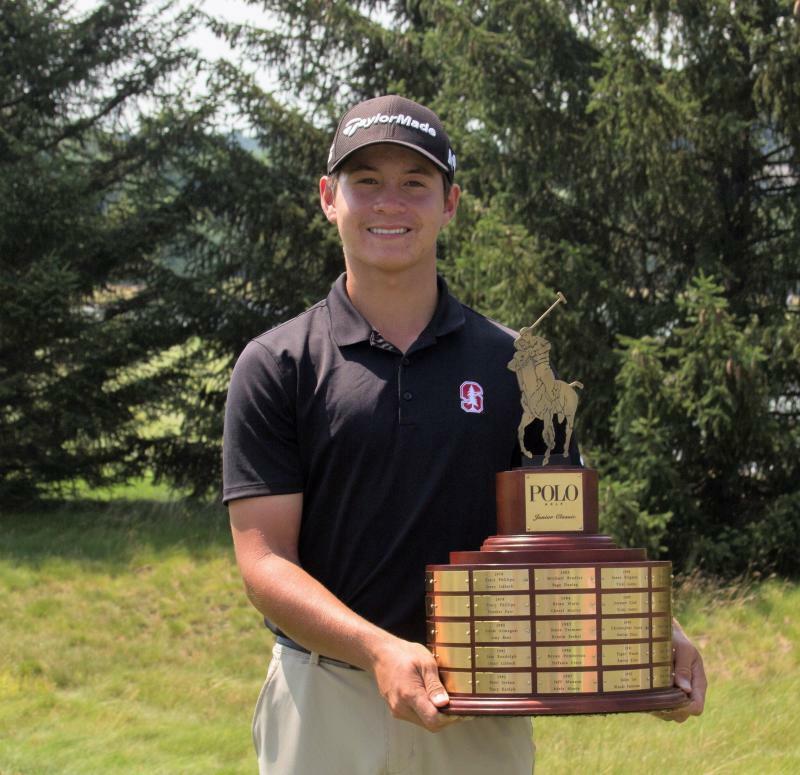 Karl has 4 and Phil 5, but Karl has 2 years of AJGA play left. Karl went 51 consecutive holes without making a boegy between the 2nd round of the previous tournament and the 2nd round of this event. That's some kind of scrambing. 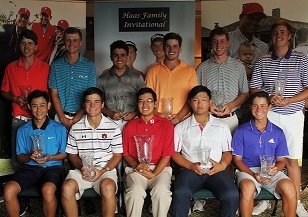 The full results and AJGA report are available here. 2018, 1st June. #1 Ranking. 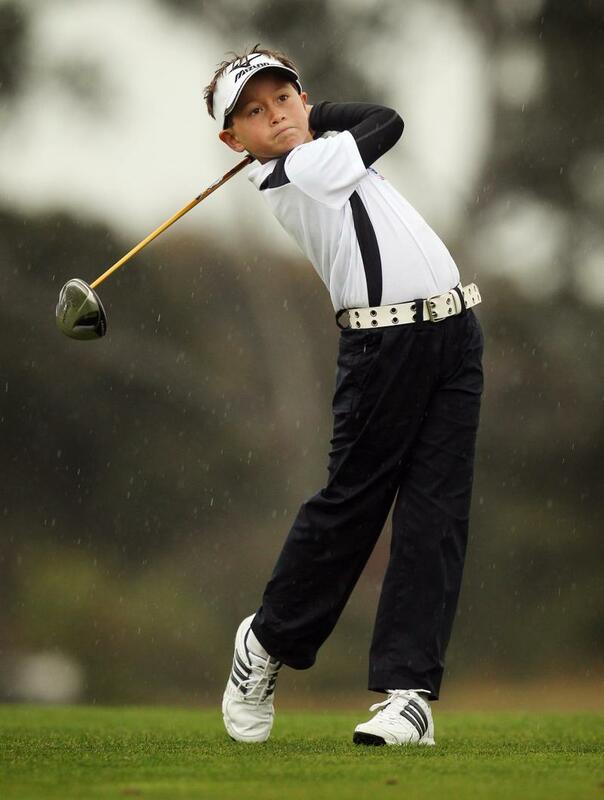 Karl ascends to the top of the Rolex Junior Rankings which ranks all juniors who have not yet commenced University. 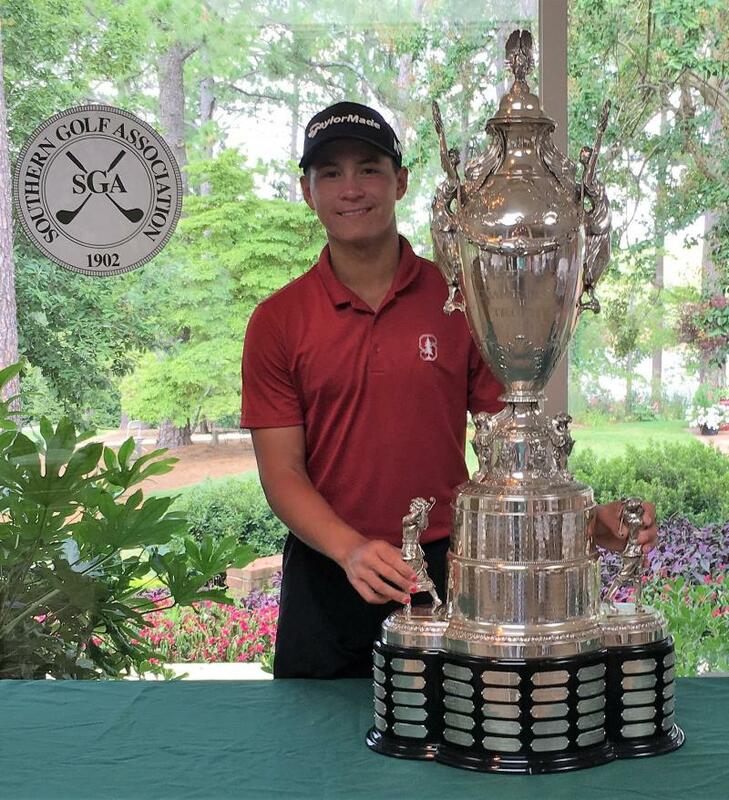 Next up is the AJGA Wyndham Championship, followed by the Western Junior and the AJGA's Polo Classic where he'll attempt to defend his title. 2018, May 25-28: 3rd Place, AJGA's Thunderbird International. Karl enjoyed a remarkable return to form with rounds of 71, 68 & 67 at Grayhawk Golf Course in the Arizona Desert, where missed fairways saw wplayers having to find their ball amongst the cactus trees. Many thanks to Coach Stephen from Saddlebrook for agreeing to trust Karl's Dad in what we felt needed to be addressed. The wonder of fast speed internet these days allowed us to share videos daily and jointly work to get Karl back to what he's capable of. The full scores are available here. 2018, April 19-21: Tied 37th, The Junior Invitational at Sage Valley. Karl's game is officially in trouble with him trying to hit all his clubs far too hard and averaging 36 putts per round which saw him shoot rounds of 77, 80 & 77. Full results here. Karl's recent results see him ask his Dad to take over his coaching effective immediately. Karl's next tournament will be in 5-week's time. Can he get his game back on track? A plan is hatched to have Karl's Dad enlist a coach at Karl's academy which he attends to work together to achive the results which we know Karl is capable of. 2018, April 13-15: Tied 26. Terra Cotta Invitational in Naples, Florida. Karl shot rounds of 72, 77 & 76. Signs that Karl's game wasn;t where it should be, with far too many putts. Full results here. 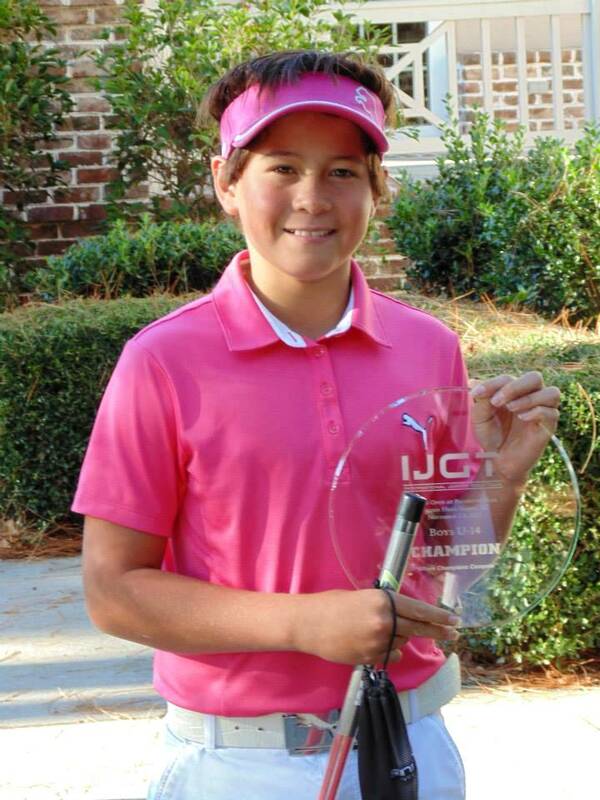 2018, March 29- April 1: 2nd place, AJGA Bishopsgate at Copperhead, Innisbrook. Karl played solid golf over the 3 rounds, shooting rounds of 73, 70, 72. The PGA Tour had played on the same course to the same yardages the previous week, so any missed fairways were penalised heavily.The highlight of Karl's play was his ball striking to the long Par 3's which measured between 190 and 225 yards, where he played them 5-under Par. The full results and yardages can be found right here. 2018, March 15-18. 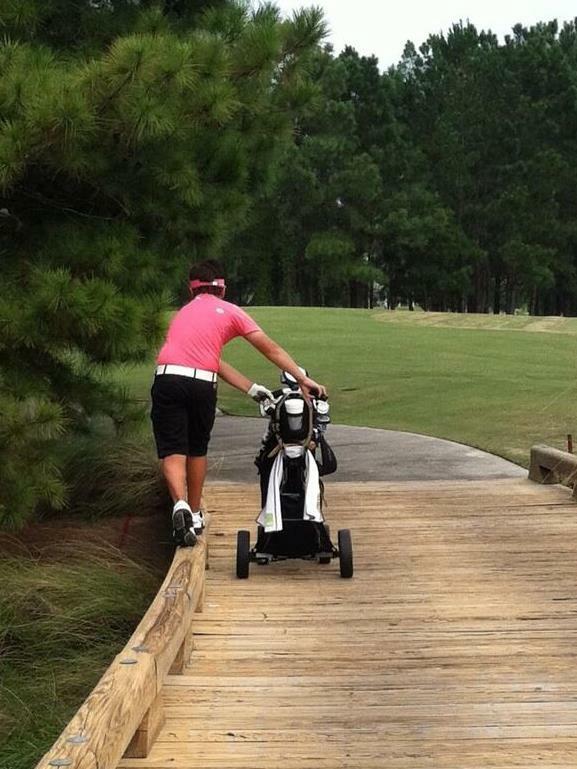 Tied 20th in the AJGA Sergio Garcia Championship. Details can be found here. 2018, January 16-21. Missed he Cut in the Australian Amateur. Karl shoots 76 & 71 and had to go into a 13-man playoff for the 3 remaining places to go through to the Matchplay, but fails to get through. Scores here. 2018, 12th January: 15th place in the Master of the Amateurs. Karl shoots rounds of 75, 77, 70 & 68 at Royal Melbourne to finish Tied 15th. Overall a good tournament, but course management in the first 2 rounds was lacking. Full scores can be found here. 2018, 8th January The 2018 Master of the Amateurs starts tomorrow on Royal Melbourne's "East Course". This is one of the year's top amateur tournaments and contains a mix of men and juniors. Check out the Draw here and the Scores here. 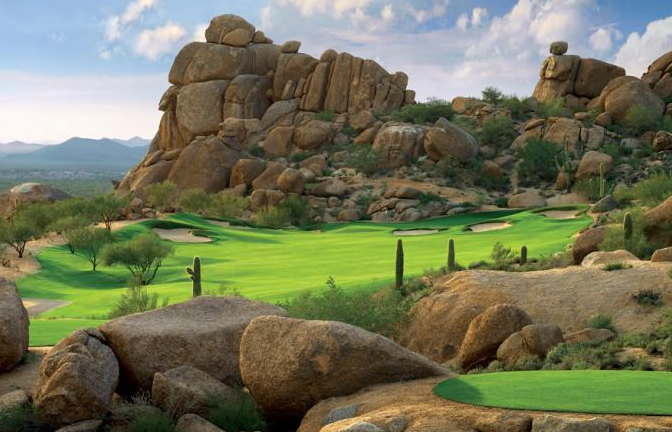 Up next: The AJGA's Thunderbird International in Scottsdale, Arizona from the 27th to 29th May. The Grayhawk Golf Club's Raptor Course is one of those magnificent desert courses that we all dream of playing one day. Karl ties for 3rd place in the 2nd annual Sergio Garcia Foundation Boys Championship. 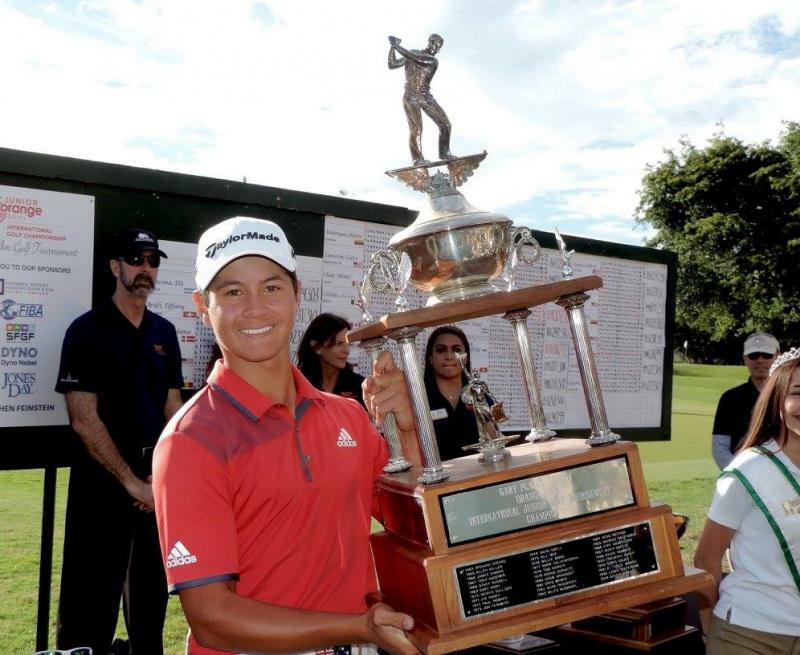 In only it's 2nd year, this tournament continues to grow, and the hottest player on the world amateur scene, Chile's Joaquin Niemann ﻿recorded his 5th straight worldwide win and sits at #2 on the World Amateur Rankings. Although Karl outscored him in the first round by 4 shots, the winner shot a 67 in the final round to beat Karl by 3 shots. 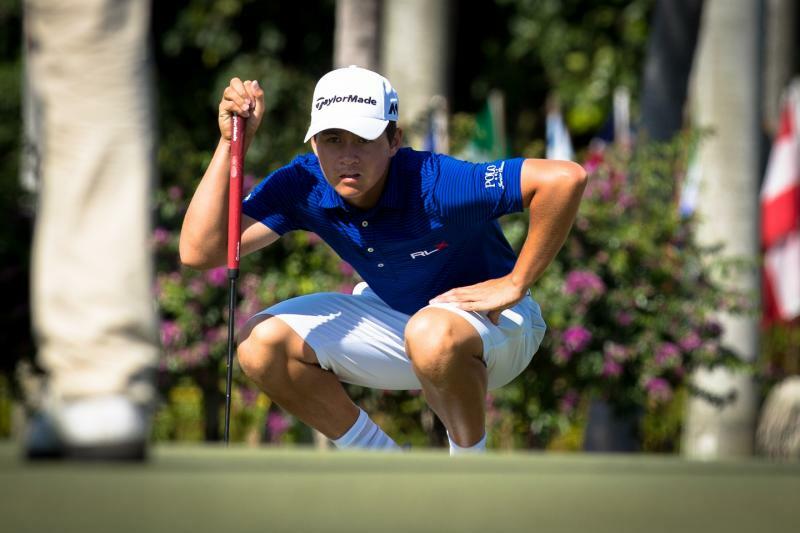 Karl's play from Tee to Green was very good, but his Putter let him down in the 2nd round. 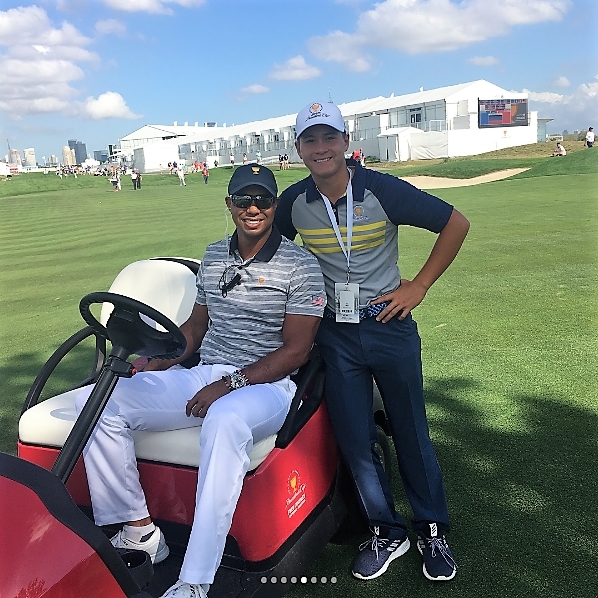 With the assistance of Golf Australia, Karl has recently started working with Jordan Spieth's coach, Texas-based Australian Cameron McCormick. They've since been working hard on Karl's putting, so we expect to see Karl getting over the line again very soon. In his first Junior Invitational at the amazing Sage Valley Country Club just outside of his goal of top 20, but overall it augers well for 2018 when he'll be a year older and a year better. Provided he qualifies each year, Karl will still have another 3 attempts at winning this tournament, so getting the experience under his belt at just 15-years is priceless. The players had a private clinic with Jason Day after the 2nd round and got to "hang" with him in the rec room afterwards. We didn't get any video of this tournament due to a delay on getting the video camera which we'd ordered. See the final leaderboard here. 21st April. 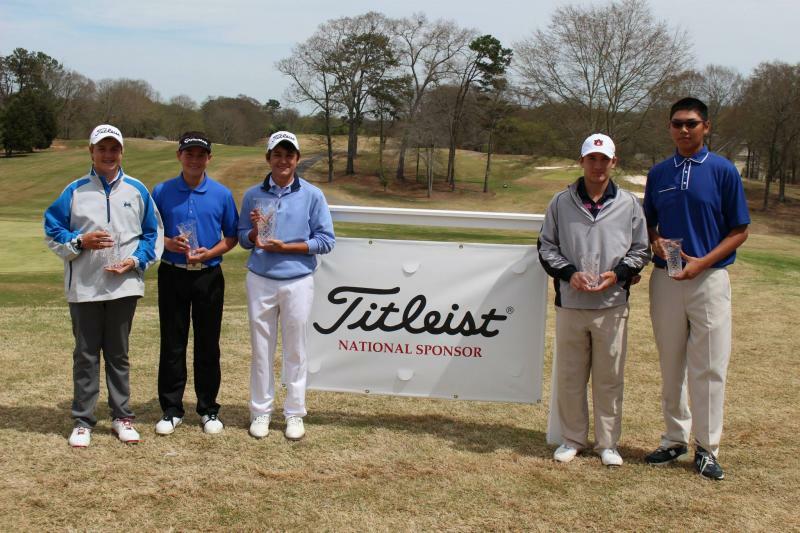 Junior Invitational at Sage Valley. 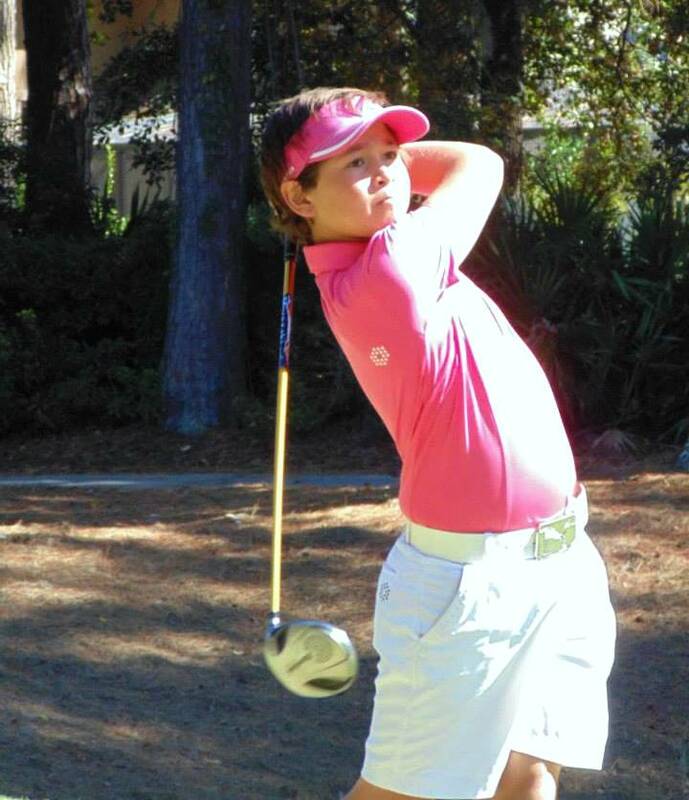 Karl's performances this past years earned him an invite into the world's highest ranked junior tournament, the Junior Invitational at Sage Valley, located just 15 minutes from Augusta National and with a strikingly similar feel. 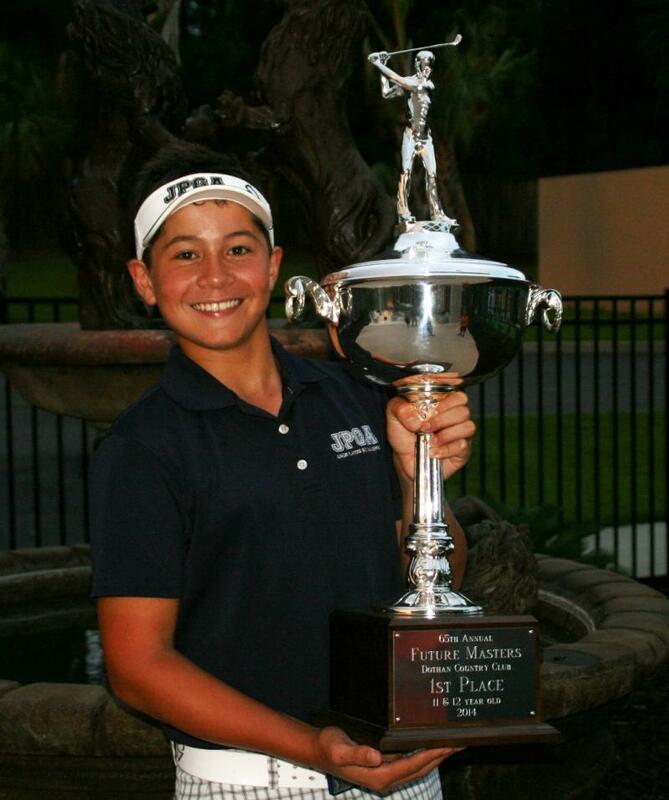 The World's #2 Amateur JOAQUIN NIEMANN﻿, who Karl beat to win the Junior Orange Bowl just 4 months earlier, was the eventual winner, with Karl finishing 22nd. Karl almost didn't play after getting hit on the head with an errant ball during a practice round, but fortunately he bounced back. See that story here. 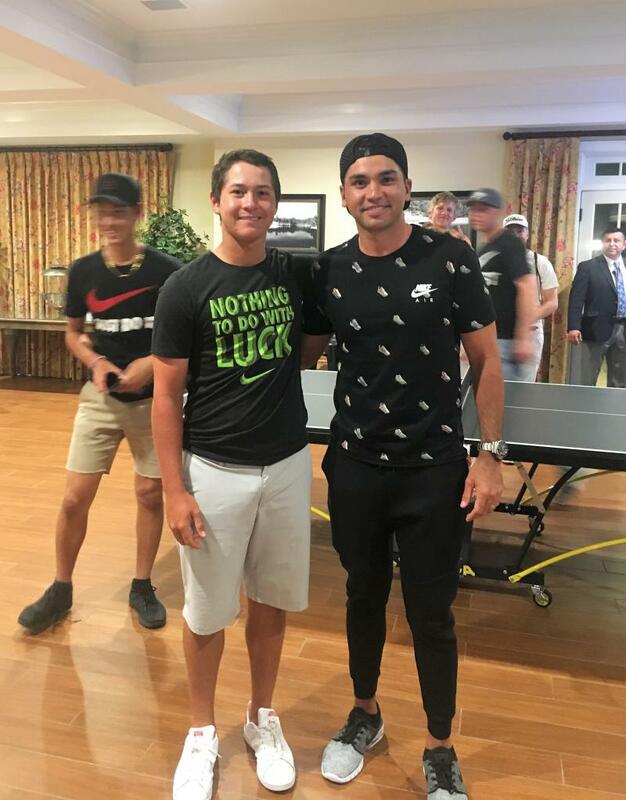 The players had a surprise visit from Jason Day on Friday, so Karl took the appropriate photo opportunity. Jason stands 6 feet tall and Karl is around an inch less than by this photo, so he's grown an inch these past 4 months alone. Karl still has another 3 years to compete in this event, and will be looing for a top finish next year, provided that he quaifies.For the full details on this tournament, visit the tournament website here. 17th March. 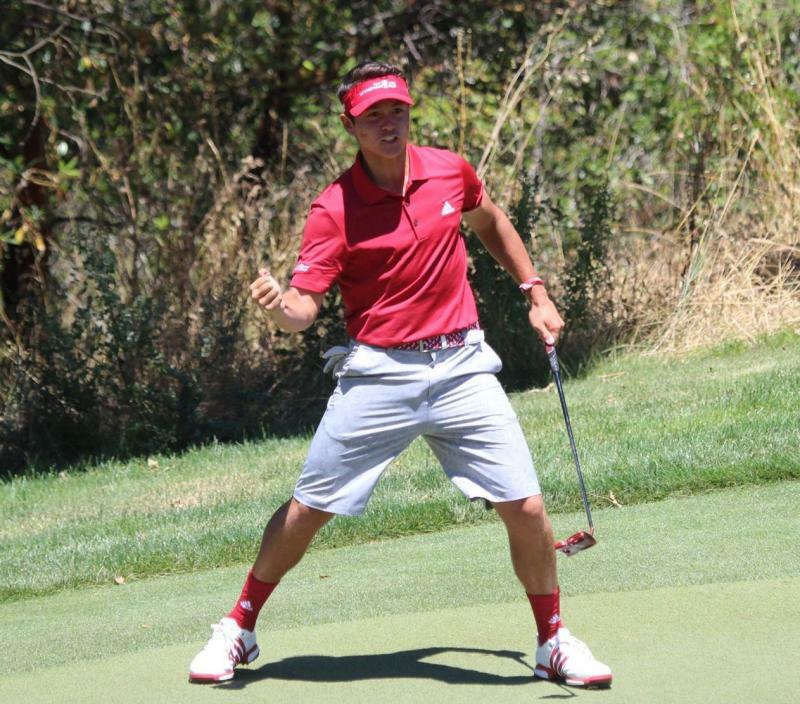 Karl publicly announced his committment to join Stanford University when he graduates High School in 2020, joining an illustrious list of Stanford golfing alumni including Tom Watson and Tiger Woods. The adjacent photo includes, from left to right, Head Coach Conrad Ray, Karl, and Assistant Coach Ryan Jamison. 7th January 2017: Tied 26th in the Australian Master of the Amateurs. This event is the 20th ranked Mens amateur event in the world and is played on Royal Melbourne's more difficult West Course. 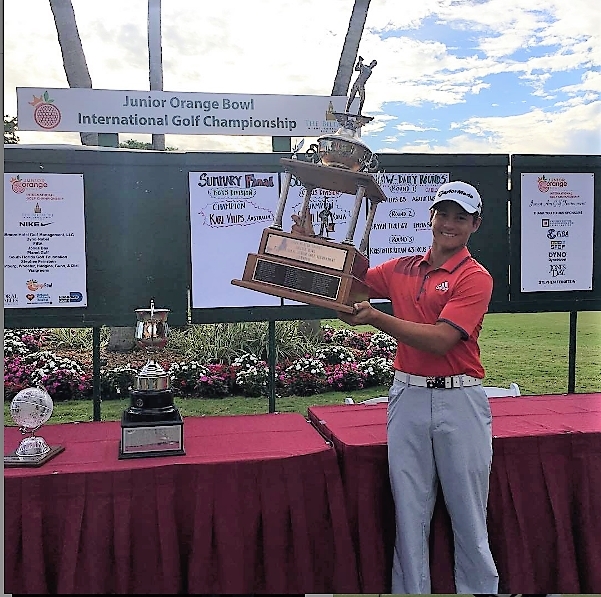 Karl had flown for 36 hours to get here following his win at the Junior Orange Bowl and performed well, including being a surprising 1st round leader after a 4-under 68. Karl played almsot perfect golf from Tee to Green but like so many in the field, he struggled to come to grips with the speed of Royal Melbourne's Greens to shoot rounds of 68, 76, 74 & 76. Leaderboard here, website here and media stories here and here. Win. 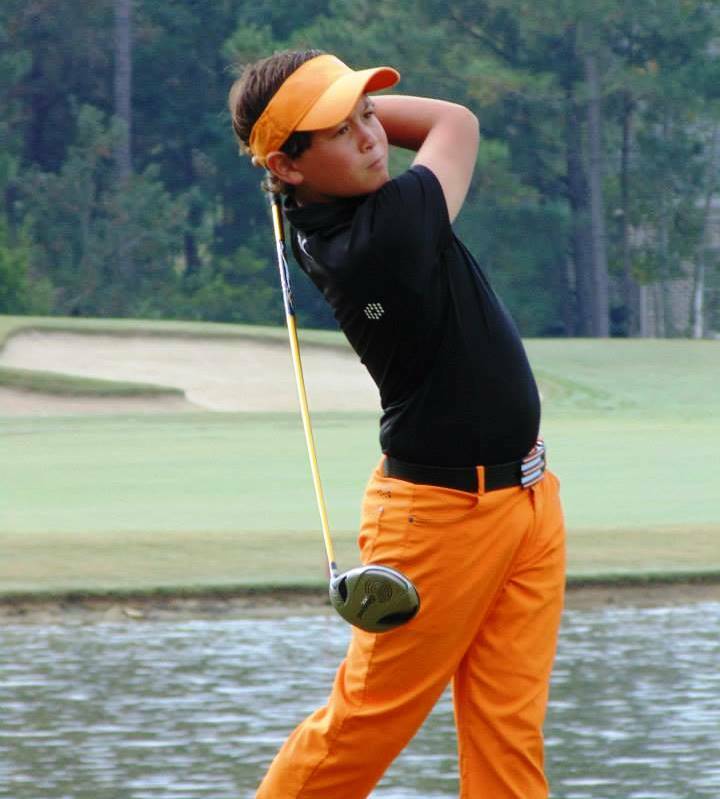 Karl manages to out-dual many of the top 18-year-olds in the world including the world's #1 in the Junior Orange Bowl. With the 3 leaders all tied walking up the 72nd hole, Karl did the unthinkable and chipped in from 40 yards for an eagle and the Win. 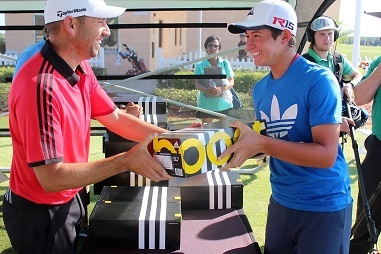 Previous winners include a 16 year-old Tiger Woods and in winning at just 15 years, Karl became the youngest winner ever. In terms of ranking, this event is ranked at the same level as the US Junior Amateur and is for players of the same age- Under 19. Scores here, tournament website is here, media story here. 22nd December: Tied for 11th at the South Beach International, the 8th ranked Men's tournament on the world calendar with a field of 218, Karl fired a special final round 65 to make a big move on some of the world's best. Pictured with Karl here is his Caddie, the Golf Channel's effervescent Tomas Vargas. 2nd qualifier at the AJGA's flagship event, the Polo International after an opening round AJGA course record 65 on the PGA National's Fazio Course. Karl goes down in the 1st round of Matchplay despite playing superb golf on the Champions Course. 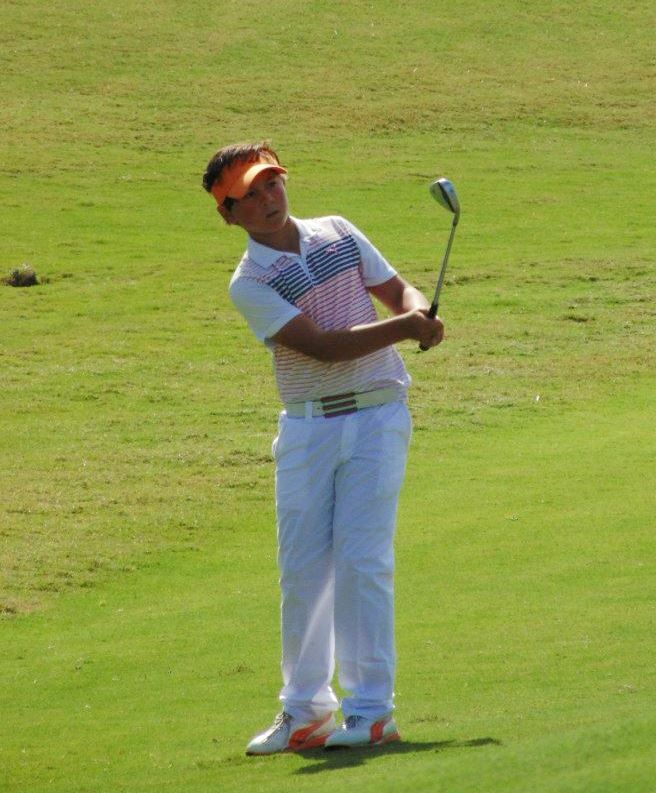 10th October: Tied 35 at the AJGA's Ping Invitational on Oklahoma State's home course at Karsten Creek. Karl's swing timing has been out of whack for the past 3 tournaments, so following this tournament, Karl came under the guidance of a specialist Swing Instructor to fix the issue. Scores here. 18th September: Tied 31 at the Bobby Chapman Inviational. Scores here. 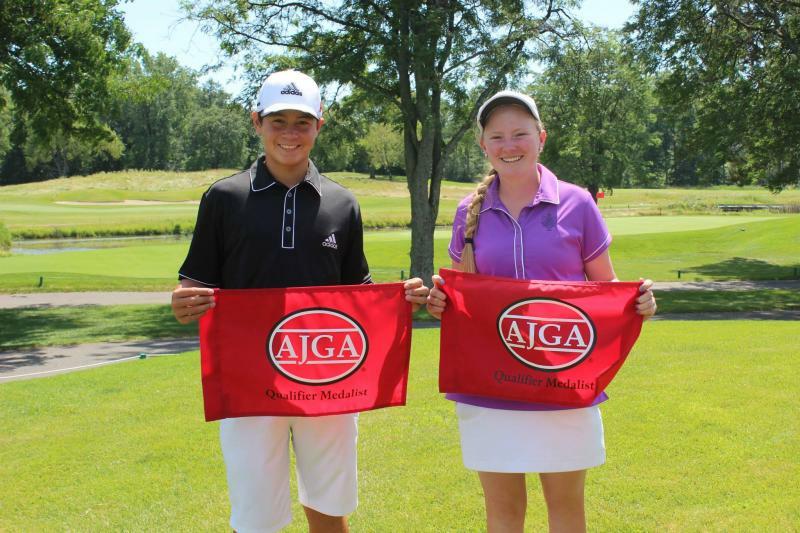 4th September: Tied 9th at the AJGA's Junior Players Championship at Sawgrass. Scores here. 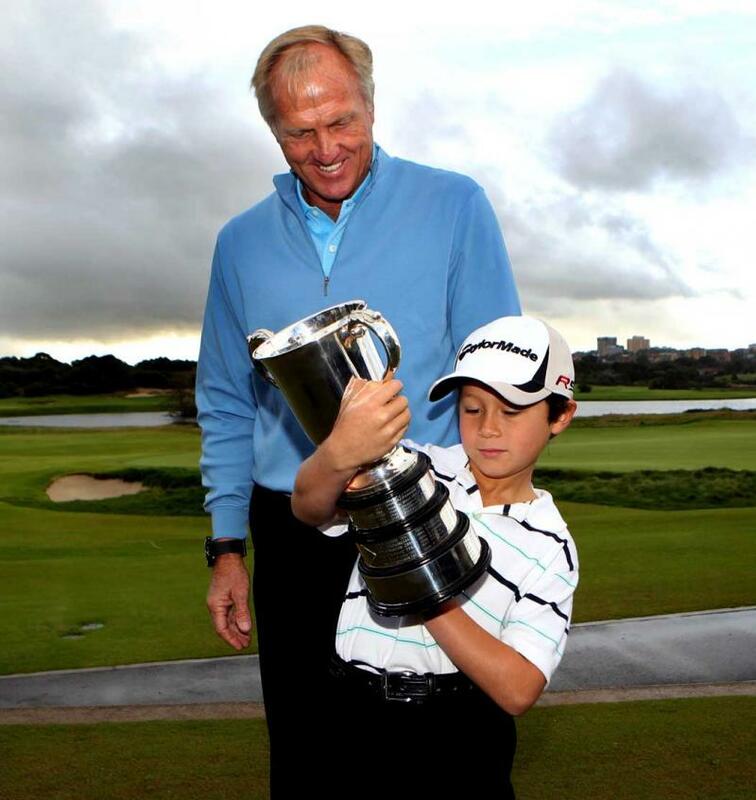 At just 14 years, the youngest player to qualify from over 7000 entrants and a year younger than Jack Nicklaus first qualified. The host course was the famed Oakland Hills in Bloomfield Michigan,﻿ host of various Majors and a Ryder Cup and where Ben Hogan had previously won. The South Course, also known by the Pros as "The Monster" is renowned as one of the toughest courses on Tour and is why this Donald Ross design has been used for so many Major tournaments. One of just a few players to shoot 71 or better on "The Monster" in tough weather on day 2, the same score as the winner Curtis Luck shot and the equal best of the Australians. 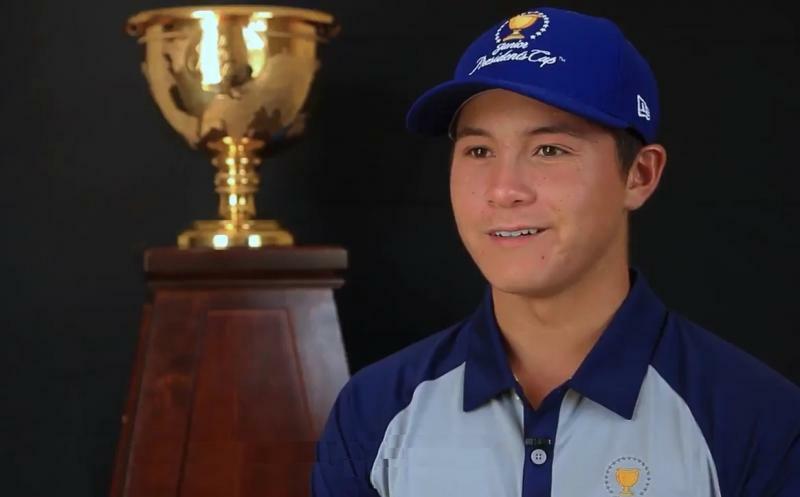 Missed the 64-player cut by 3 shots from a field of 312 players and in the process finished higher than the 2014 winner and equalled this year's US Junior Amateur winner and fellow Aussie Min Woo Lee. 16th August: Karl turns 15 years of age. No more need to fly as an unacompanied minor. 3rd August: The Western Amateur. This is the 3rd oldest Amateur tournament in the world and regarded as the 2nd strongest amateur tournament after the US Amateur. This year the field included a wopping 46 of the worlds top 100 ranked men (not juniors) and Karl gained an invitation due to having been inside the top 10 of the Polo National Boys Rankings. This is also the most gruelling event in the world, with 4 rounds of stroke play before the Matchplay segment kicks in. The field is cut to 44 & ties after the 2nd round then to 16 players after the 4th round. 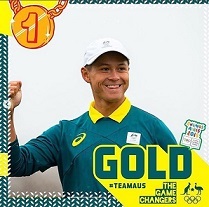 Karl missed the first cut by a single shot with rounds of 72 & 74, but walked away knowing that he'd outscored 20 of the worlds top-100 ranked players and that only 4 of Golf Australia's team of 11 players outscored him. 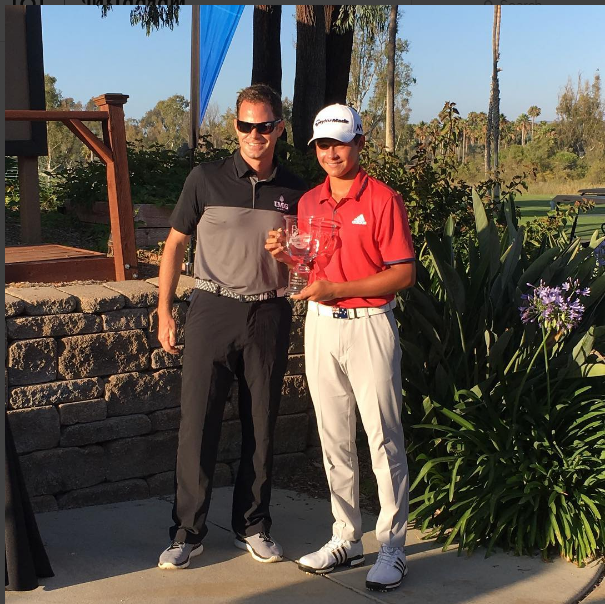 Karl's consistency from tournament to tournament is becoming his biggest strength and an attraction to coaches from the very best college golf programs in the US. Scores and tournament info are available by clicking here. 25 July: Wyndham Cup week is a representative tournament where the top 10 boys and girls from the west and east coasts compete in a Ryder Cup style format against the other coast. Karl became the youngest boy to compete in this event, nudging out Jordan Spieth purely because Jordan's bithday is in July whilst Karl's is in August. Karl's goal was to beat Jordan's record of 3 Wins, 1 Loss and no Halves, but after having 3 straight Wins, Karl twitched something in his back on the range during the warm-up for his last match- the Singles, causing him to be restricted with his swing. Massages between holes saw Karl get to the 17th hole before eventually going down 2 & 1. Remarkebly, Jordan also went down in the singles. The tournament link is here. 20 July: Qualfied for the US Amateur. 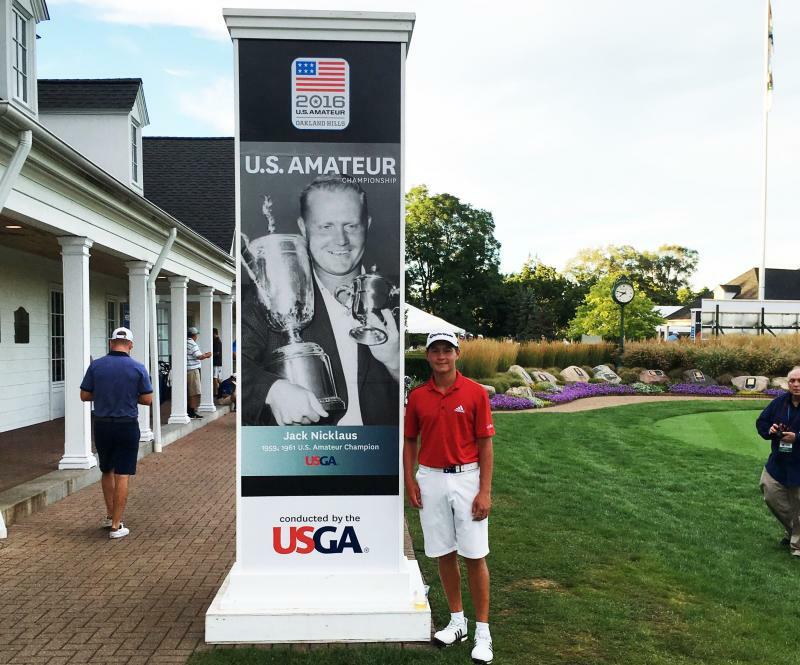 Karl becomes one of the youngest players to qualify for the US Amateur. Rather than attempting to qualify on a short course, Karl attempted to qualify on the 7350 yard Panther Lake course at OC National in Florida. Amongst the field were the #2 junior in the US, so Karl knew he had to play his best and recorded rounds of 67 and 68 to take the 2nd of the 3 qualifier spots up for grabs. Scoreboard here. 15 July: Runner-up. Junior World Championships in San Diego. Karl shoots rounds of 64, 70 & 69 for a 10-under total, but gets pipped at the post by 1 shot. That score would have won in all except one other year at this course, but Karl achieved hs goal of shooting that score. 23rd June: WIN. 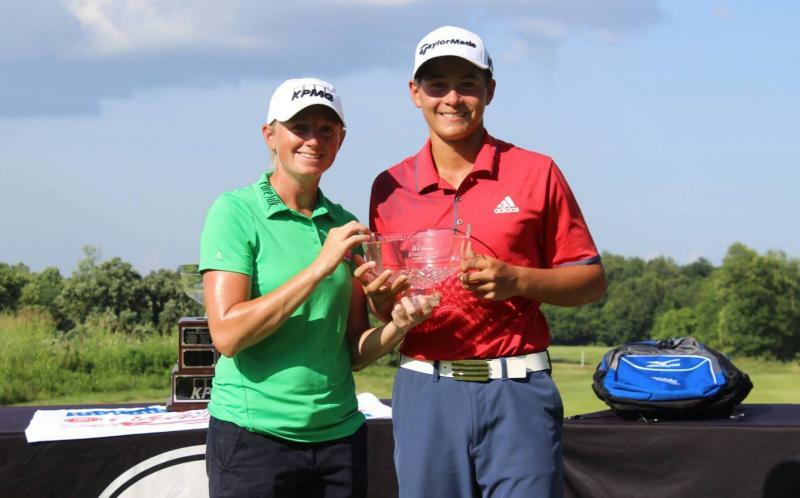 Karl gets back to his winning ways at the AJGA's Stacy Lewis Inviational with a dramatic come-from-behind win where he started the final round 3 shots back and then Birdied the 1st Playoff hole by sticking a 150 yards 9-iron to just 4 feet. 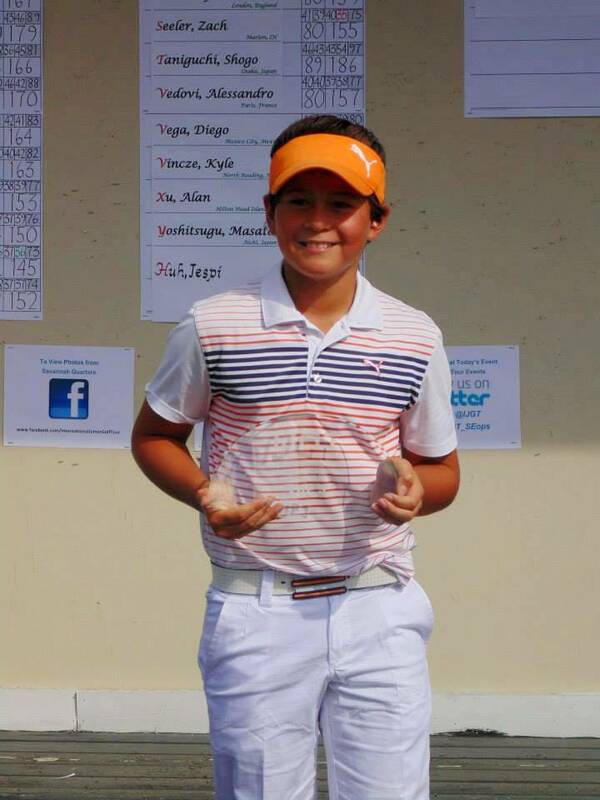 This was Karl's 3rd win from just his 6th AJGA start. The Arkansas Razorback's Home track was an extremely tight layout that demanded accuracy off the Tee and the patience to lay back and leave more club into the Green in exchange for taking a lot of risk out of the equation. 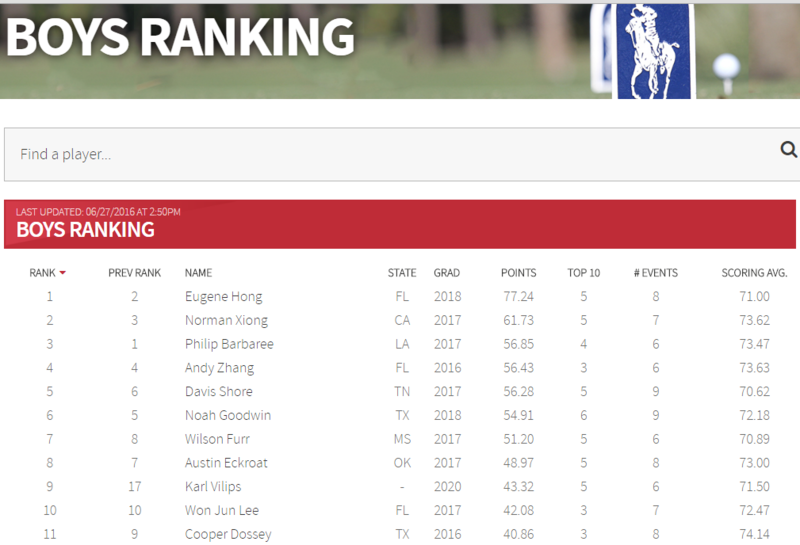 Karl had rounds of 72, 70 & 68 and it'll be interesting to see where his ranking climbs to after this round, as to the best of our knowledge, no Middle Schooler has ever broken into the Top-10 of the Polo Rankings. Check out the tournament homepage here which includes the scores. There's also a fun video of the competitors kicking back and having fun right here. 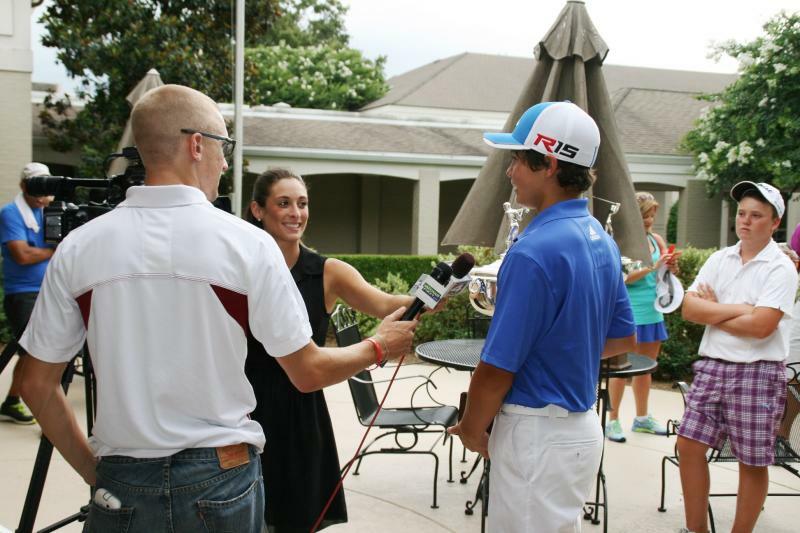 18th June: Tied 3rd in the AJGA's Haas Family Invitational. This was possibly Karl's greatest performance to date as he took it to the USA's best juniors under University age. Karl's efforts on the 7115 yard Sedgefield Country Club's Donald Ross layout from the same Tees as the PGA Tour players play from in the PGA's Wyndham Championship now see Karl vault up to 17th on the Polo National Rankings and gives him a start in July's Wyndham Cup- where the top 10 boys and girls from either side of the Mississippi go to war in a Ryder Cup style format. 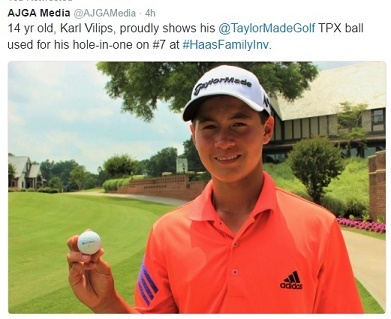 15th June: Ace Alert: AJGA Haas Family Invitational update: 70 & 68 see Karl in 2nd place and 2 off the lead. An Ace on the 7th hole today certainly helped. Keep up-to-date with the scores here. 14th June: A good Media article on Karl by North Carolina journalist Ed Hardin. (see here) appears in the local and state media. 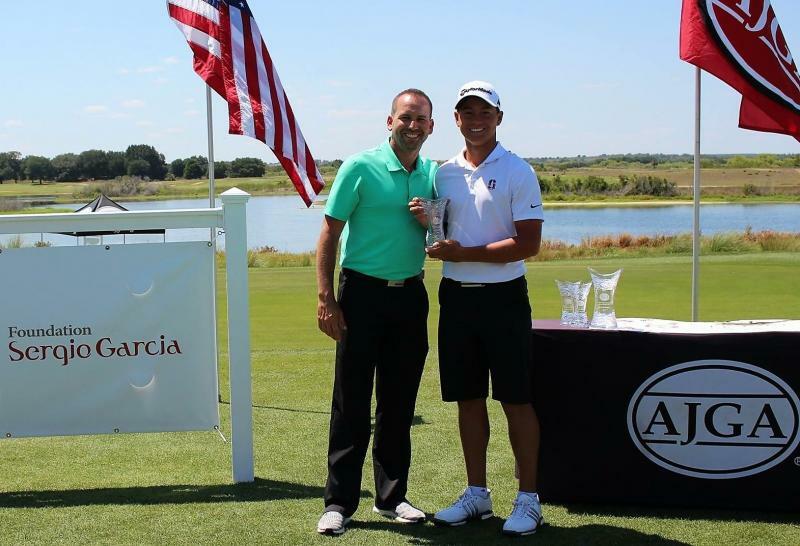 13th June: The AJGA's tournament director Andrew Greenfield had his crystal ball working well that week when he predicted that Karl, despite not having ever played an AJGA Inviational, was someone to who could do well. (see here). 12th June: The AJGA Haas Family Inviational﻿ is just 2 days away. 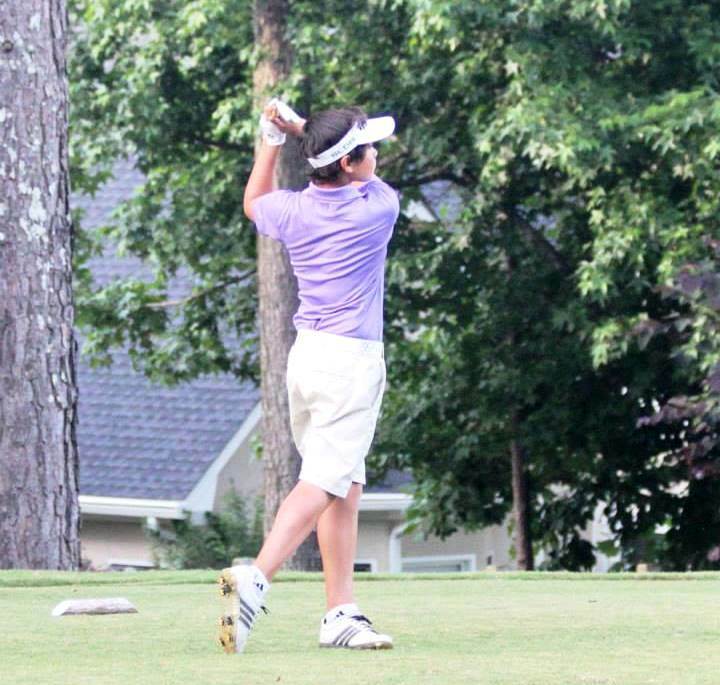 This will be Karl's first AJGA Invitational. It'll be played on the same course, Tees and yardages as the PGA Tour's Wyndham Championship. Keep up-to-date with the scores here. And yes, there is Live Scoring, click here. 10th June: Lucky escape. 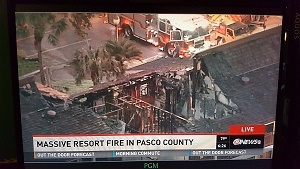 With just a few days before Karl's first AJGA Invitational, fire destroyed much of his student accomodation. Fortunately, one of the students awoke at 2am to the smell of smoke and raised the alarm, so all 32 students got out. Some of the students on the top (2nd) level lost all their possessions, whilst students on the lower level (where Karl was) suffered water damage. 7th June: 3rd place in the US Junior Amatuer qualifier at Lafayette, Louisiana. 1st and 2nd went straight through to the US Junior Am and Karl is classified as a 1st Alernate, giving him a less than even chance of getting a start. Good effort though considering that Karl was playing with a head cold. 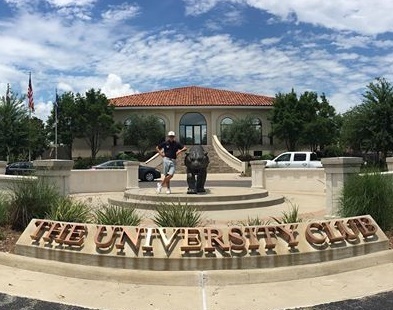 He shot a 74 in the morning and came back strong in the afternoon with a 3-under 69.
scheduled for the following day, but feeling like crap due to coming down with a head cold, he makes the best use of the day and pays a visit to LSU (Louisiana State University) and checks out their Men's Golf Program. 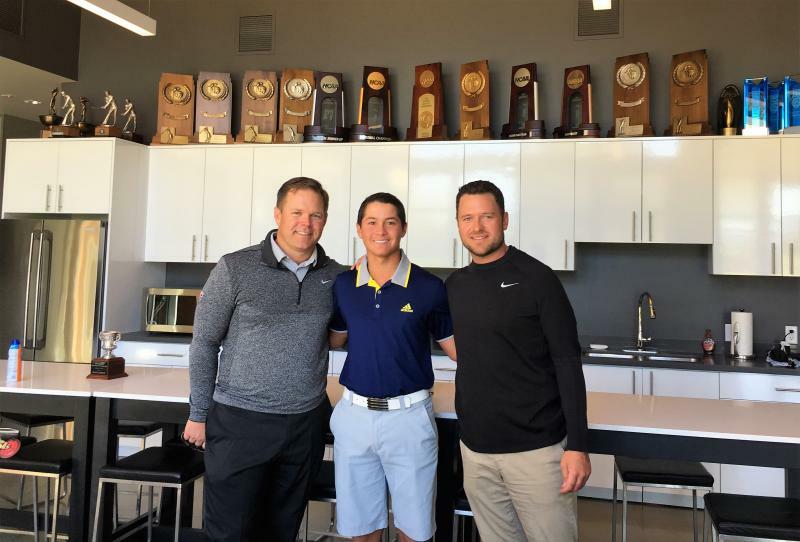 LSU won the NCAA Men's golf title 2 years ago and are on his shortlist of colleges he's considering for when he graduates high school. 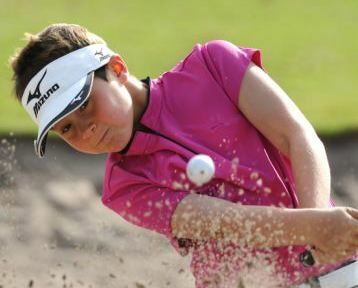 12th May: Karl climbs back up to 40th position overall (ages 12-18) in the Polo National rankings following his performance at the Sergio Garcia event. 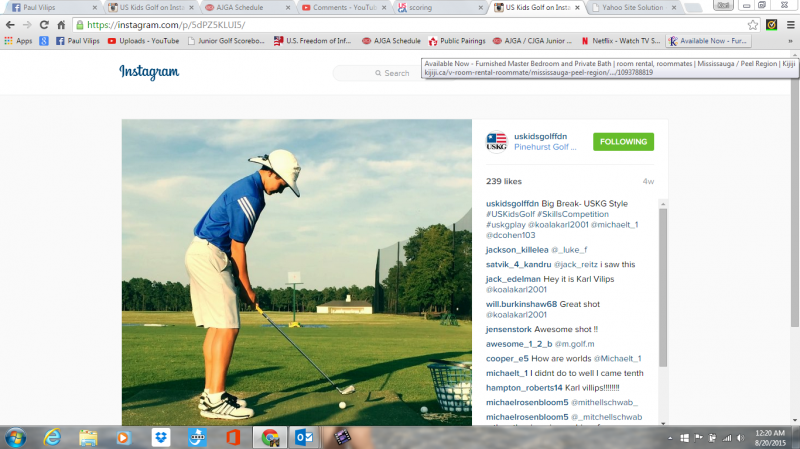 THis new ranking sees Karl receive inviations to 3 upcoming AJGA Invitationals. 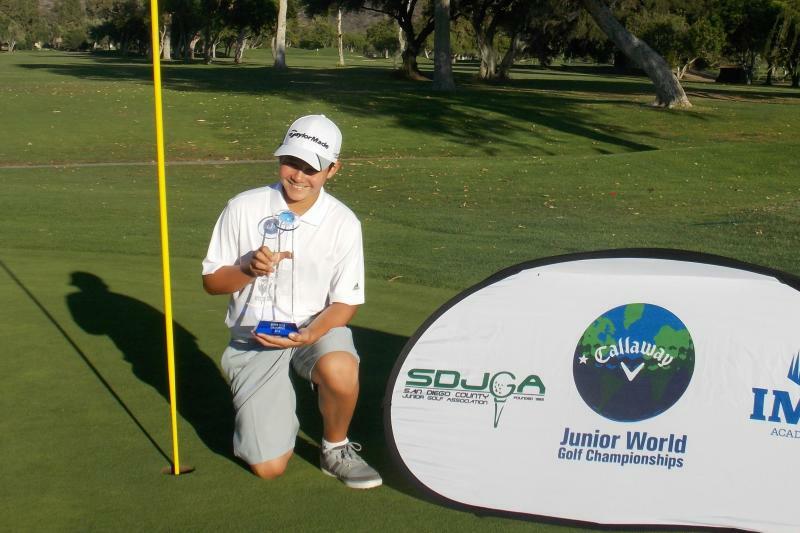 8th May: Tied 8th in the Sergio Garcia AJGA Junior Championship. Karl puts in another solid performance- this time against the 18 & under age with rounds of 74 & 70. Karl was lucky to get to spend some time with Sergio and even helped him with the clinic he conducted. 20th April: 1374. Karl's new World Amateur Ranking following his solid result at the Men's Terra Cotta Inviational. 16th April: Karl shoots a solid 3-over Par 75 Second Round in windy conditions and as a result, moves up the Leaderboard to share 30th position. Tomorrow's final round is forecast to be even windier, so expect to see Karl move up a little more due to the fact that he has already played the previous 2 rounds using less than Driver for all but 2 or 3 holes, so he already knows that he can shoot a solid score without using Driver off every Tee. Leaderboard here. 15th April: A 4-over 76 in the 1st Round sees Karl sitting in the middle of the field. This is a "B" Ranked Mens event and is ranked at the same level as the top AJGA Invitationals and a tournament which Karl played last month in Melbourne, The Riversdale Cup. The biggest difference however, is that this event contains a mix of adults, college players and top juniors. The course is played from over 7000 yards and features Tip Dwarf Bermuda Greens that are tricked up to 13.5 on the Stimpmeter for this event. Karl feels that it's without doubt the best presented course that he's ever played on, which would explain why it's ranked as one of the top 100 courses in the USA. If you'd like to view the Leaderboad, click here. To view Karl's wrap-up of the first round, click here. 14th April: The Terra Cotta Invitational in Naples, Florida. Although not originally on Karl's schedule, Karl accepted an Invitation to play in this prestigious Men's Amateur and in the process became the youngst competitor in its history. Past players in this tournament include Sergio Garcia, Matt Kuchar, Bryson DeChambeau, Patrick Red, Justin Thomas and Daniel Berger. This year features 25 players who are ranked inside the Top-1000 in the Men's World Amateur Rankings. The website is here. 14th March: Karl leaves for the US. Initially planned as a one tournament trip, we decided to keep Karl in the US due to the risk of him having future visa issues after he almost didn't get through Immigration on this occasion. Those keen observers will recall that Karl's previous golf academy he attended in 2014/15 closed its doors and left him with visa issues that prevented him re-entering the US since August last year. Having already seen first-hand how devasting being denied entry can be, this close call on this occasion saw us decide not to risk Karl having any further visa issues and to simply keep him there for the time being and let him study there. 10th to 13th March: Men's Riversdale Cup. Karl tackled another world ranked event. The 121st running of the Men's Riversdale Cup is ranked as a "B" level tournament, one level below the Australian Amateur. Caddies were allowed but failing having anyone available who knows his game well, Karl decided to go it alone and did exceptionally well, firstly in making the Cut in this prestigious Men's event where 120 Men started and the top 42 & Ties got through. He managed to Tie for 32nd position and to (yet again) finish above National Squad players who are much older. Official results can be found here, whilst we have a library of video that can be found in a Playlist we created for the event here. 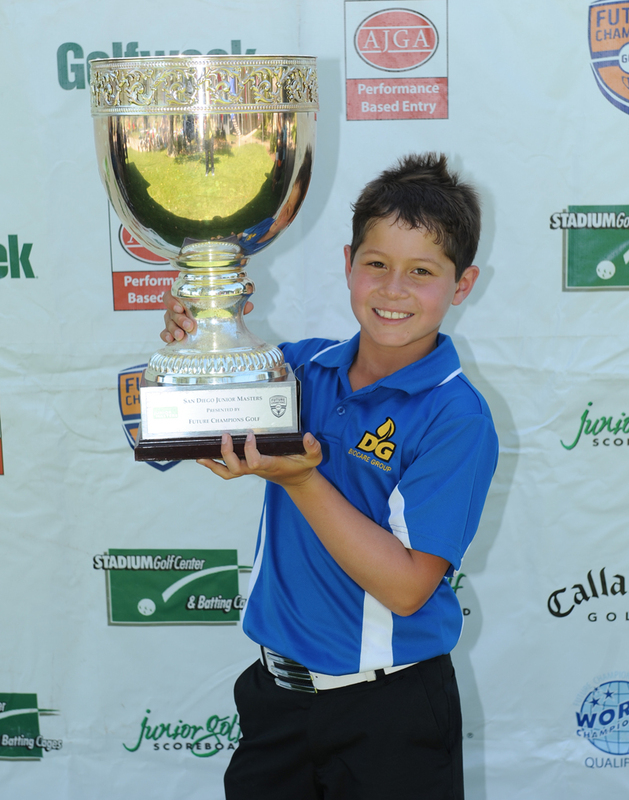 5th & 6th March: Karl played in the 23rd Boroondara Cup played at neighboring clubs Kew and Greenacres. 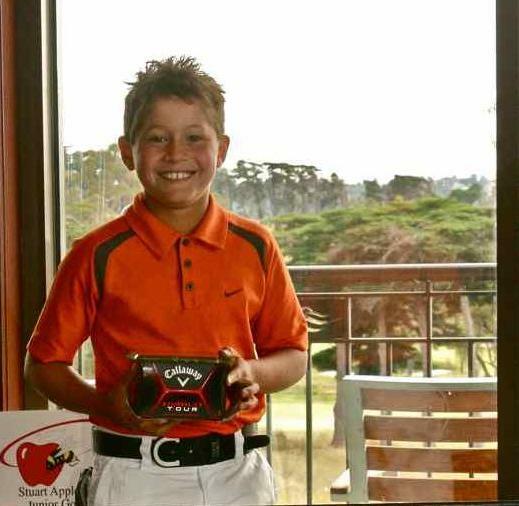 Play was 36 holes per day over 2 days- yes, gruesomely brutal for a 14-year-old. The experience however, was valuable and Karl discovered how difficult it was to maintain 100% focus for all 36 holes in a day. As a result he had blow-up holes late in each day that cost him dearly, but being a Men's World Amateur Ranked event, this was never a tournament where Karl was ever expected to win. He ended up finishing 20th in an 84-string field. Results here and video is here. 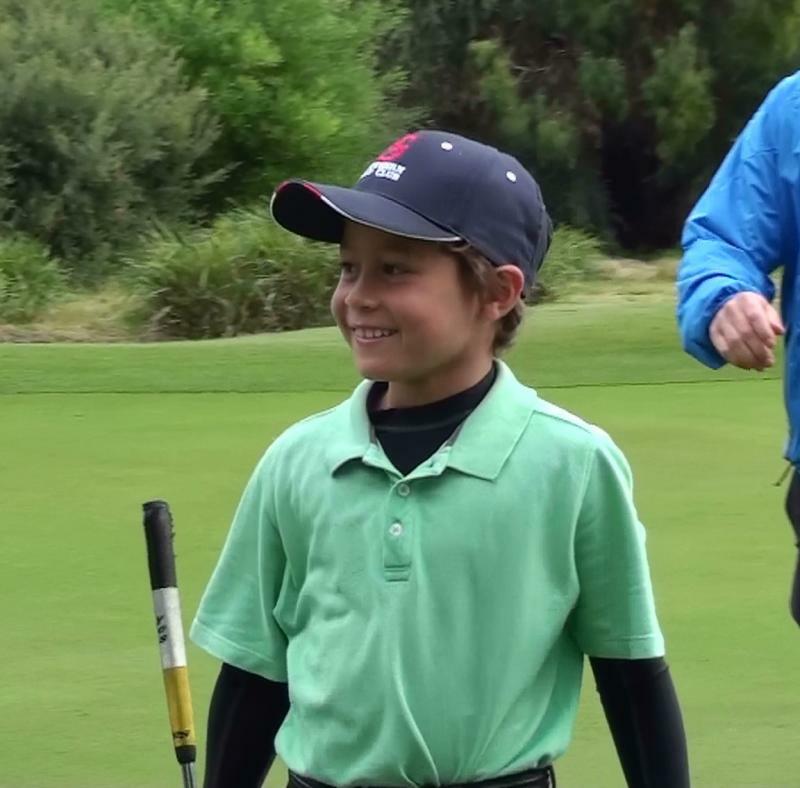 9th thru 11th February: Karl competes in the Pro Am at the Victorian PGA Championship at Huntingdale Golf Club. It was agreat experience to play alongside the Pros for 3 days. Video of Karl's rounds are here. 3rd February: Pro Am. Karl plays the Oates Victorian Open in British Open conditions at 13th Beach. He loves a challenge and responded well, shooting even Par. Video here. A big Thank you to the appropriate people for getting Karl a start in the field. 1st February: Pro Qualifier for the Oates Victorian Open. Karl shoots a 74 to miss qualifying by 3 shots. Scores here and video here. Good signs with Karl's Putting, which has been his achilles heel of late. 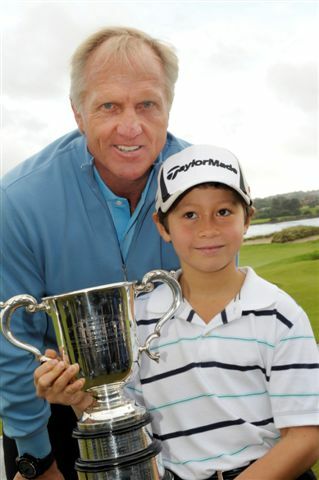 29th January: Tasmanian Junior Masters. T19th. A tournament which Karl would like to forget. The club ran out of range balls, seeing Karl receive just 18 balls to warm up with, some of which were Balata balls dating back some 20 years, with some players getting 50-odd balls and some players getting none at all. Karl's 112mph swing speed requires a thorough warm-up and he simply didn't get anywhere near what could even be called the bare minimum for a warm-up, resulting in his accuracy on the course being all over the shop. During a weather delay the National Junior Squad was announced online, resulting in total bewilderment. At that point, the energy and competitiveness you normally see in Karl's eyes disappeared and he shot his worst tournament scores in memory with 80 & 76. As a parent, it was heartbreaking to see Karl feel like that. 12th January: Men's Australian Amateur. Karl competes against many of the world's best amateurs and makes the cut to get into the Matchplay section by finishing 46th from the 64 available spots which included a 3-under 69 on the Sandbelt classic Metropolitan. He came against Australian Team member Brett Coletta in their round of 32 Match and Karl eventually went down on the 17th hole. Official scores here and video here. 6th January: Karl finishes 7th overall (18 years division) in the 2016 Victorian Junior Masters despite having no home course to practice at. Scores here and video here. 1st January: Karl's 2016 What's in the Bag video is now available here. 7th December: We return to Australia with just Karl's golf clubs and 3 suitcases to start over after Karl's US Student Visa for 2015/16 was denied. 6-iron to 117 yards at the 2009 Junior Worlds, Scorecard here. 6-iron to 176 yards at the Tarheel Golf Tour event at Foxfire Resort. Video here. 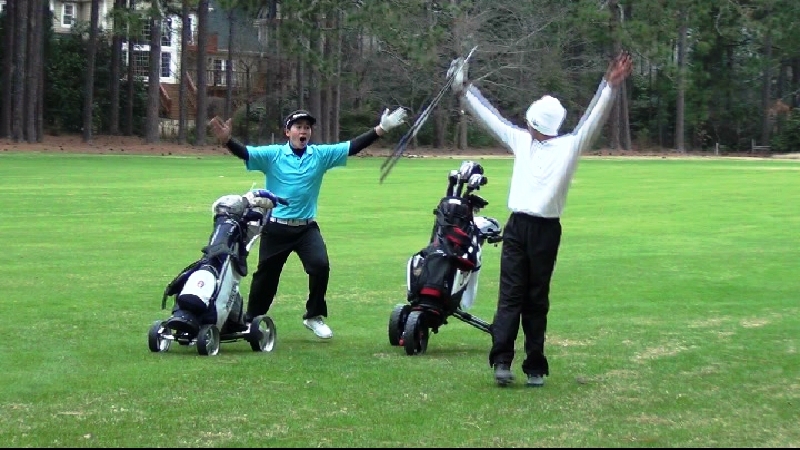 6-iron to 175 yards at the Brampton Golf Club's "juniors closing day", Video here. 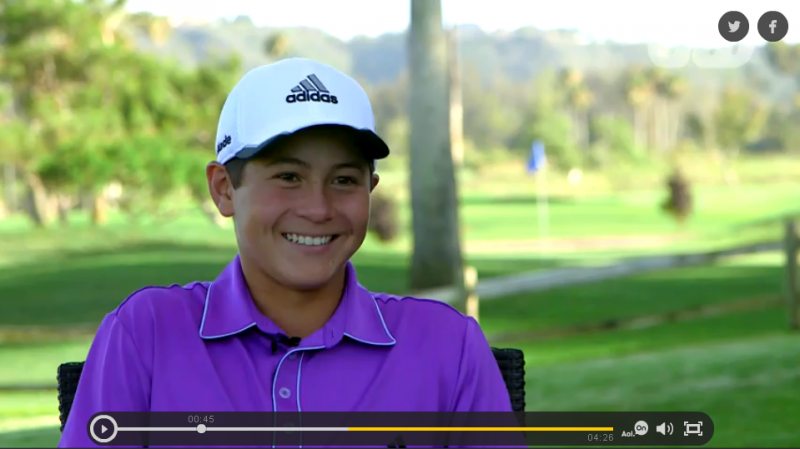 Karl joins an illustrious list and appears in a feature by Golfing World TV which was recorded at July's Junior Worlds. Karl's composure is surprising for a (then) 13-year-old. Check it out here. 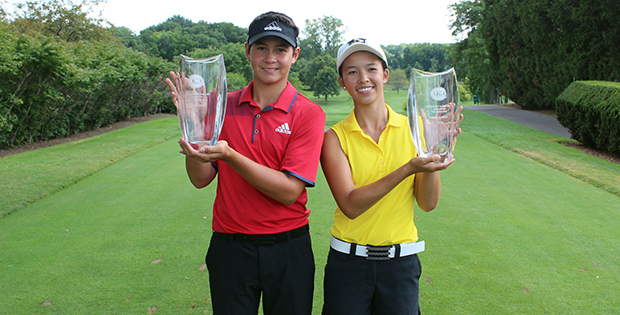 Karl wins his 2nd AJGA Open, this time in Canada. 27th August: 2015 AJGA Junior Allstar Team selection. Karl joins an illustrious list of names including Spieth and Fowler by being named one of the 10 boys into this year's Allstar Team. Details here. 20th August: We forgot to post this video from US Kids Golf from last month. Enjoy it. 6th August: WIN. 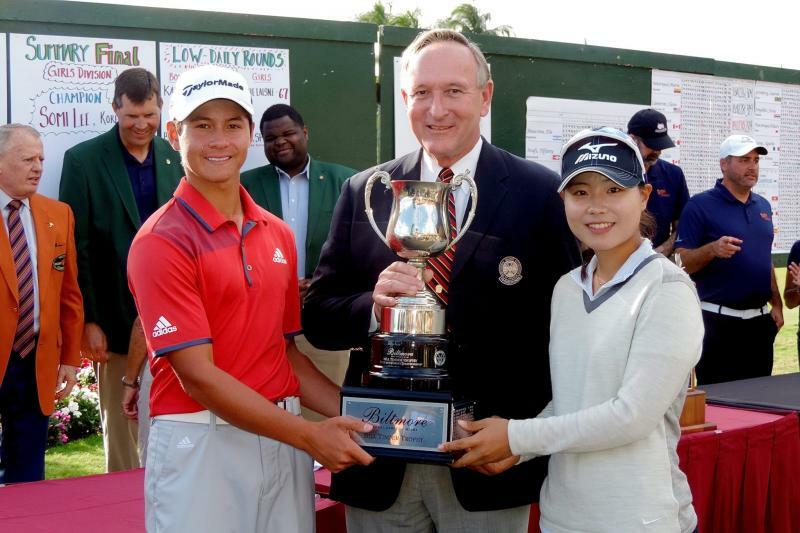 Karl defies his 13 years of age to take out an AJGA Open title against the 18-year-olds. The course set-up well for Karl due to requiring deadly accurate wedge shots to what could only be described as dastardly Greens. Many who thought the short yardage would be easy were wrong, with only the top 2 players breaking Par for the week. 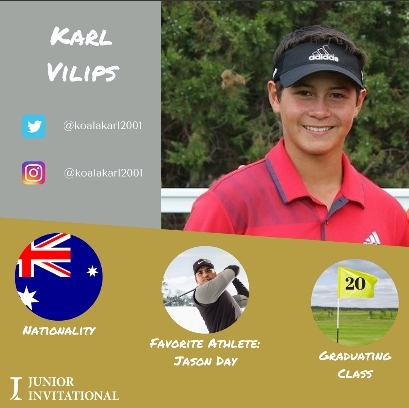 The win means that Karl will sit right on the #100 spot on the Polo Rankings for 18 years and below, thereby seeing him invited into the sought after AJGA Invitationals. 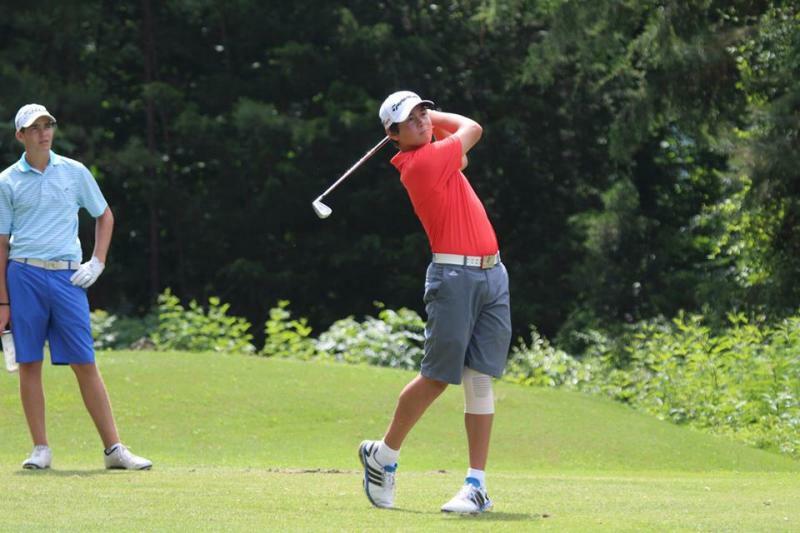 Karl has just one ore AJGA event he can play for the season due to players being allowed a maximum of 5. 2nd August: Win. 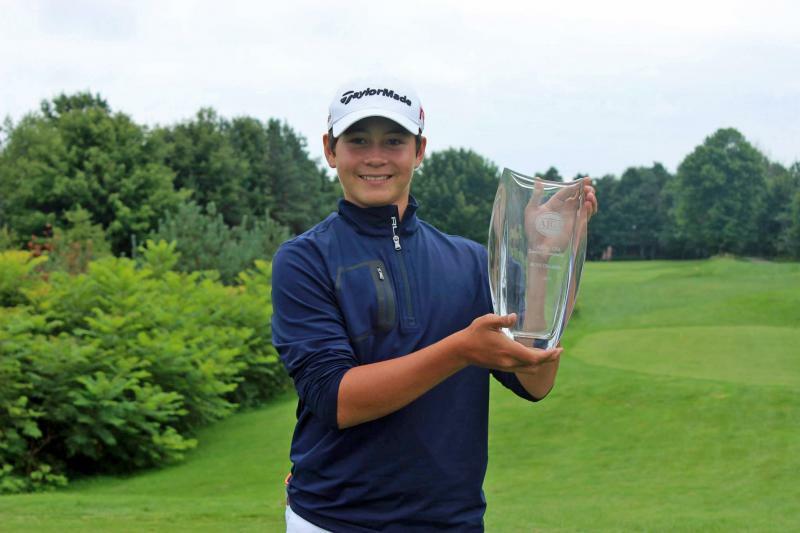 Karl, despite being 13 years-old, wins the qualifier for the AJGA Open at Forest Lake by 3 shots against a field of predominantly 17 & 18 year-olds. Karl's 68 saw him finish 3 clear at the top and secure his place into the main field. Why did he qualify instead of simply entering due to him having more than enough ranking to get straight in? Simple- entry fees need to be paid 6 or so weeks out from an event and we simply didn't have the funds to fork out the fees for multiple events 6 weeks ahead. As such, Karl had to play this tournament the hardest way known. 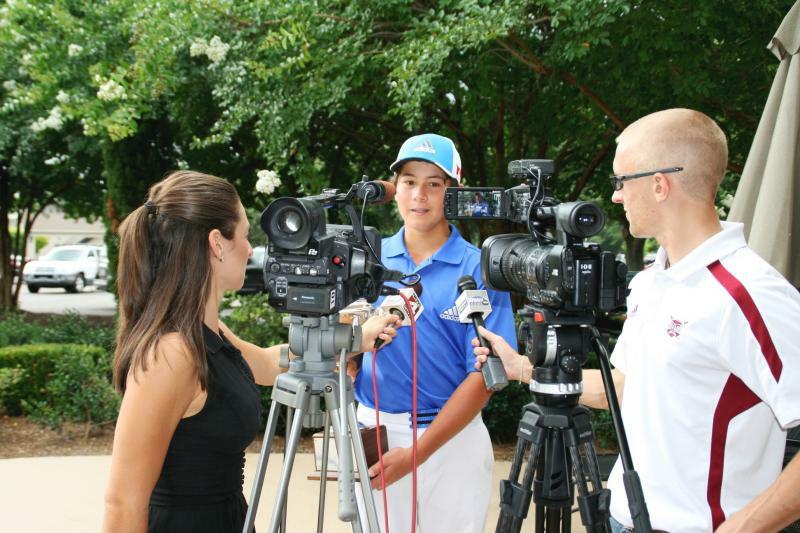 25th July: Tied 18th at the US Teen Worlds in Pinehurst. Karl had cuaght a cold whilst playing in the rain in San Diego after the Junior Worlds (Who says it never rains in California). Teetering on whether to withdraw or not before the 1st round, Karl argued the case to be allowed to play based on his optimistic belief that if he felt better on the 2nd day that he may be able to make up for a likely bad 1st round. He opened with a gallant 78 and you'll see in the video jst how "spent" he was by halfway through that round. The 2nd round wasn't a lot better, but at least he managed to get halfway through the back 9 before losing all his strength, shooting a 78. Waking up feeling better on Day 3, Karl finally had the strength to get through the entire round and was one of only 7 players to break Par, finishing in a Tie for 18th out of 160-odd players. 17th July: Tied 6th at the Junior Worlds. Karl exceeds his goal of top 10 as a freshman in this 13-14 years age group to tie for 6th. Great Tee to Green play but his putter betrayed him too many times. Coulda, shoulda, woulda! 29th June: US Junior Am Qualifier. 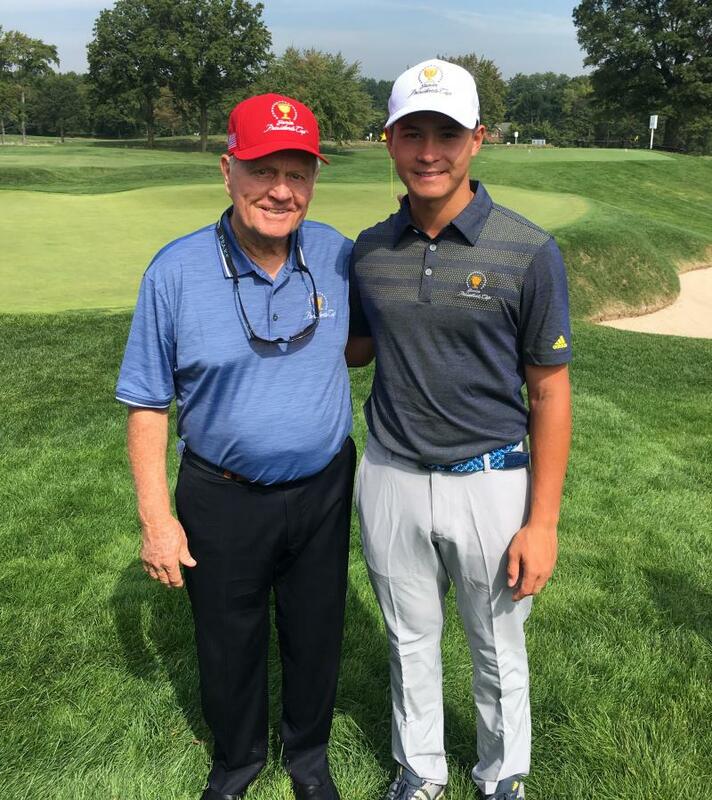 Karl misses out on qualifying for the US Junior Am. This qualifier was Karl's 1st effort and we learned a lot about why it's so important to choose the qualifying site. This site (Berkeley Hall) was played off 7116 Yards on damp fairways with less than a yard of run-out, whilst some qualifying sites were played off as little as 6600 yards. To get to one of those however, we'd have to had spent mony on airfares, etc, so Karl didn't have that easy option. The players entry conditions were being less than 18 years of age and having a handicap of less that 4.9. Despite this, some of those 35 players who finished the gruelling 36 hole day shot both rounds in the 80's. Incredibly, 15 players failed to even finish. Karl wasn't able to capitalise on good Tee-to Green play on the recently core'd greens, but typical of Karl, he hung in there until the very end and posted rounds of 76 & 79. The good news- he still has another 4 years to qualify. The full results are here and video of Karl's round is here. After rounds of 69, 67 & 68, Karl goes down in the 3rd Play-off hole of the 66th Press Thornton Future Masters 13-14 years title. 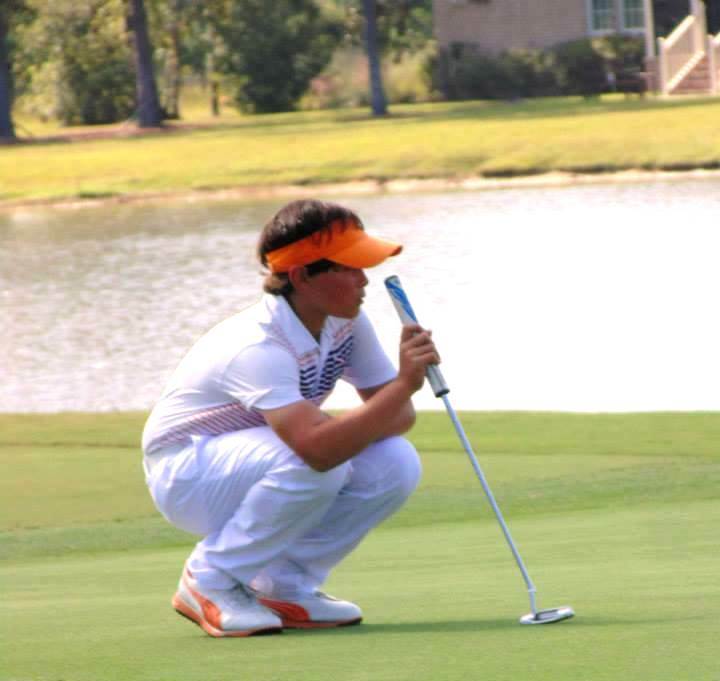 Karl had won the 11-12 years title last year in this strictly invitational event featuring the very best junior boys on the east coast here in the US and was looking at going down on the last hole of regulation play before draining a 25' Birdie Putt to get his way into the final. Rightly or wrongly, Karl had initially focused on taking care of the other 3 players from the lead group and after establishing what he thought was a comfortable lead, was happy making safe Pars before discovering at hole 14 that England's Joe Pagdin was going low and was just a shot behind him. Karl then put on the after-burners and Birdie'd holes 14 & 15 before making bogey on 16 & 17 as the winds picked up ahead of a summer afternoon thunderstorm which adversely affected his high ball flight. As Karl walked onto the 18th Green on the 54th hole of the tournament, he alrady knew that he had to make Birdie. You'll have to watch the video here to see what happened next. The press write-up of the play-off is available to read here. 17th June: Win by 14 strokes with back-to-back 65's in the High School (up to 18 years) on a Donald Ross classic that is Southern Pines in Pinehurst. Karl's Putting was on fire with just 25 & 27 putts on his 2 rounds, including just 11 putts on his back nine 30 from his 1st round. Karl played this event at the last minute due to it's length and set-up being similar to the Future Masters due to be played a few days later. The leaderboard can be found here and the videos of Round 1 here and round 2 here. 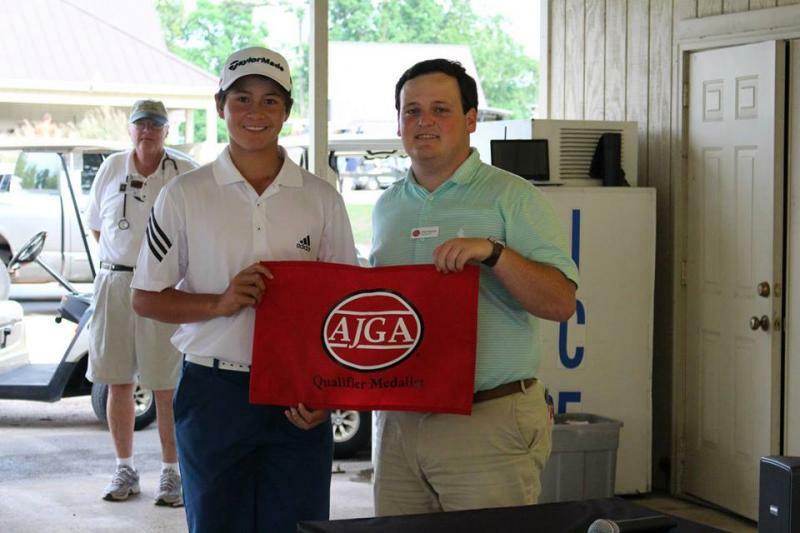 4th June: 74, 73 & 78 during the AJGA Junior Allstar at Ringgold represent a disappointing tournament for Karl after such a promising result during his qualifier. At the end of the day, if you are not getting the putts to the hole, you are simply not making Birdies. Yes, the Greens did get slower as the tournament progressed, but Karl needs to identify this a lot sooner during his rounds and adjust accordingly. His rounds were similar to watching Adam Scott- incredible from Tee to Green, yet a lack of Birdie conversions which are required to offset the inevitable Bogies which Karl tends to have due to his aggressive style of play. Karl's next event is the Press Thornton Future Masters where he will be defending his crown. Most of the PGA players who grew up on the east coast played this event as juniors, as it's regarded as a junior "Major". Tournament scores are available here. 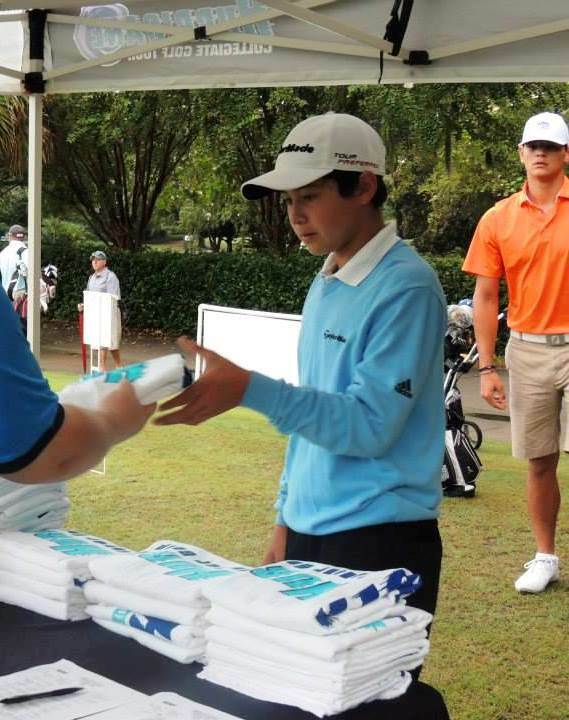 Armed with new shafts, Karl goes to town at the AJGA Qualifier at Ringgold, Georgia. Karl actually has enough results to have not have had to do the qualifier and instead been the top ranked player for this event, but we didn't have the funds to pay for the tournament fee at the time, instead having the $95 Qualifier fee. He won the qualifier in the 90-strong fiield by 5 shots from the next placed player. Video here. 29th May: New shafts. Suspecting that Karl's shafts had become too soft for him after anothergrowth spurt, Taylormade arranged for Karl to drop by "The Kingdom" at Reynolds Plantation, Georgia whilst we were enroute between Pinehurst and Georgia. They discovered that his swing speed had increased to 112 mph and fitted him with firmer shafts. The result? Driver carry of over 285 yards. See the video and the Trackman date here. 25th May: 8th Place. 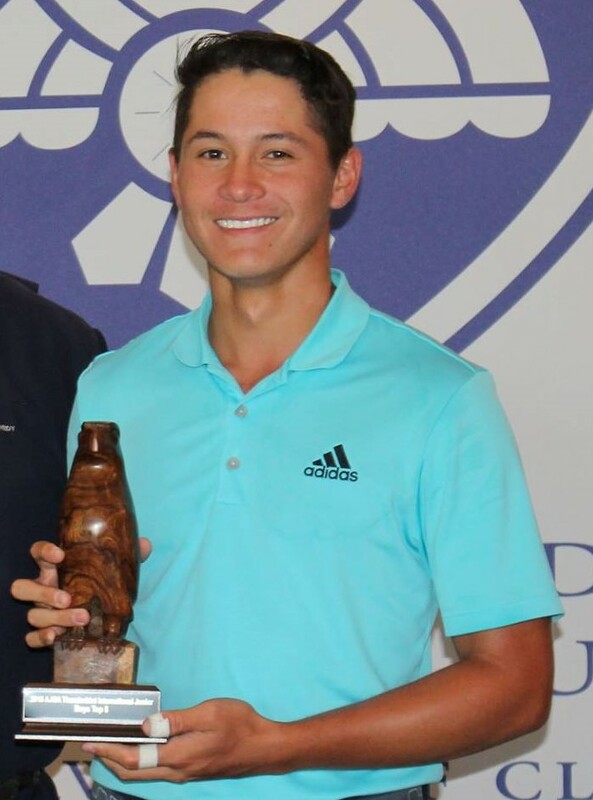 Rounds of 71 & 72 see Karl perform well at the Tarheel Golf Tour's season ending Golf Pride Tour Championship at Talamore resort, Pinehurst. From Tee to Green Karl played excellent golf, resulting him sharing the lead after the first round. His inability to deal with the slow Greens in round 2 saw him accumulate 36 putts- 6 more than his average, to fall down to finish T8th with a 77. 17th May: 12th Place. After a month's break, Karl struggles to come to terms with the concrete Greens at the invitation only Scott Robertson Memorial with rounds of 76, 78 & 72. His striking was excellent, but quite simply, he didn't score. Full results are here Video here. 22nd April: Although not yet in High School, Karl plays at #2 for his 5-member High School team. This Tuesday they played on the Pete Dye layout at Hampton Hall in Bluffton (next to Hilton Head) where Karl was paired against the USA's #66 ranked Junior. on the challenge and eventually shot a 2-under to outplay his opponent by 4 strokes. Next week they progress to the state finals at Myrtle Beach. Take a close look at Karl's Driver Swing right here. 6th April:﻿ 4th. 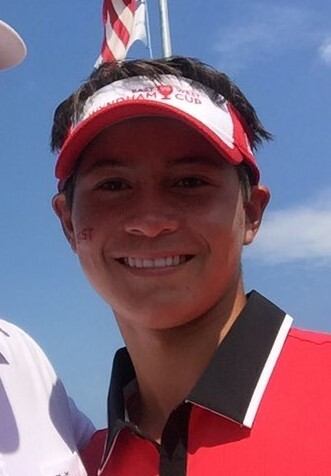 In just his 2nd AJGA Junior Allstar, 13-year-old Karl finishes strongly, just 2 shots behind the winner for 4th place in the field of 90 of the best 12-15 year-old's who travelled from across the USA for this event, the AJGA's flagship Junior Allstar for the year. Karl's rounds included 10 Birdies and a quintuple bogey, living up to his reputation as someone who never quits after a distastrous hole. Leaderboard (and Karl's scores) here. 24th March: 2nd Place. Karl comes up a shot short of getting into the Playoff for the High School division in the UNC State Junior Championship by Tarheel Junior Golf. Karl's short game was nothing less than outstanding this weekend, with a handful of normally makeable missed Putts ultimately being the difference. 19th March: The What's in my bag" page has been updated to the 2015 spec. Click here. 13th March: Karl completes his 2015 What's in the bag video. 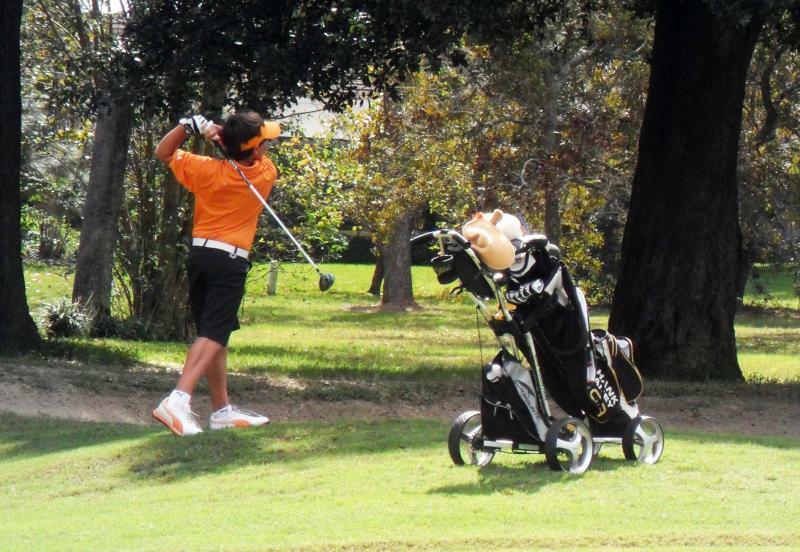 16th February: Karl competed in his first AJGA Junior Allstars tournament and finished 25th. 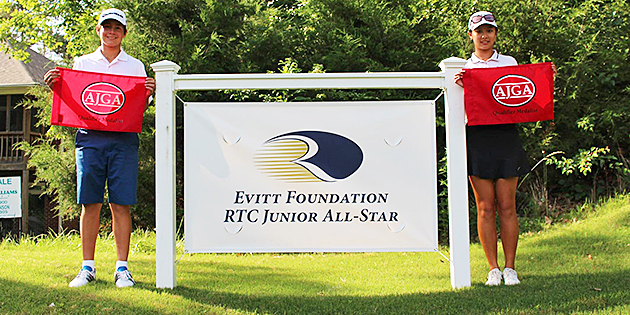 The AJGA Junior Allstars is the pinnacle of tournament golf for 12-15 year-old's in the US with players flying from across the country to compete. Players can only compete if they have accumulated enough tournament performance points (the AJGA refer to them as Performance Stars), so only the very best get to play. Interestingly, the 12 & 13 year-olds compete against the country's best 14 & 15 year-olds. This entry requirement should give future players incentive to choose their regular tournaments that can help gain them entry into AJGA events, as competing in small, easy fields will actually harm the player's national ranking, irrespective of whether they win. Karl went into this event sufferring from the flu so was lacking much energy, but he prevailed steadily and scored rounds of 74, 76 & 74. Since this event Karl has had his annual clubfitting and is now fitted with shafts that suit his current power, so watch out for dome low scores at upcoming events. 2nd February: 2nd after Play-off. 13 year-old Karl takes it to the 15-18 year-olds again and narowly misses out on his 2nd win in that age division. 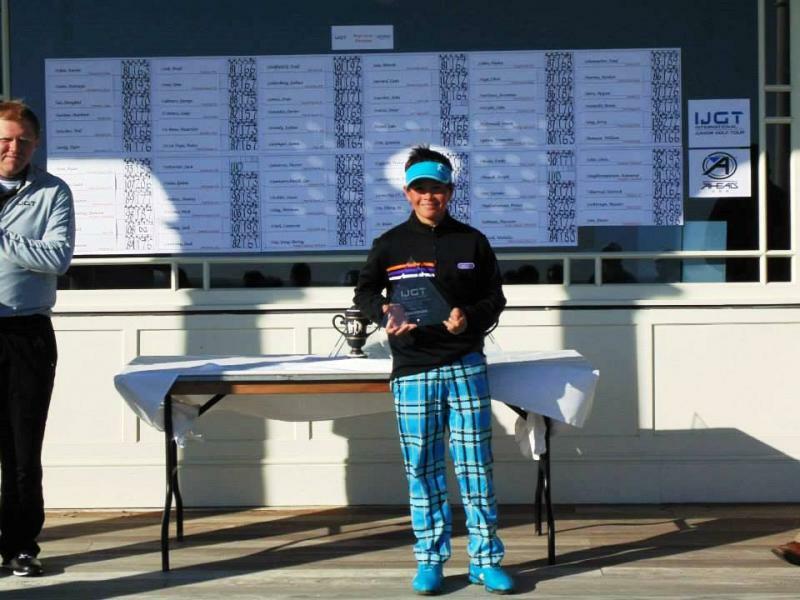 This weekend was a Taheel Junior Golf Tour event at the Country Club of North Carolina loacted in Pinehurst where 52 High School players braved freezing conditions on one of North Carolina's very best courses. Sub-freezing temperatures affect the playing conditions, with the ball travelling approxiamately 15% less than it normally would. The Greens were still frozen at the start of the 1st Round which prevented the Grounds staff from drilling that day's Pin locations in and also making the interaction between the ball and Greens on Approach a hit & miss affair with some approach shots bouncing off the green as if landing on a footpath, with others accepting the spin. Accordingly, the yardage was reduced to 6590 Yards. Karl sat 1-shot off the lead after the first round following an even Par round. 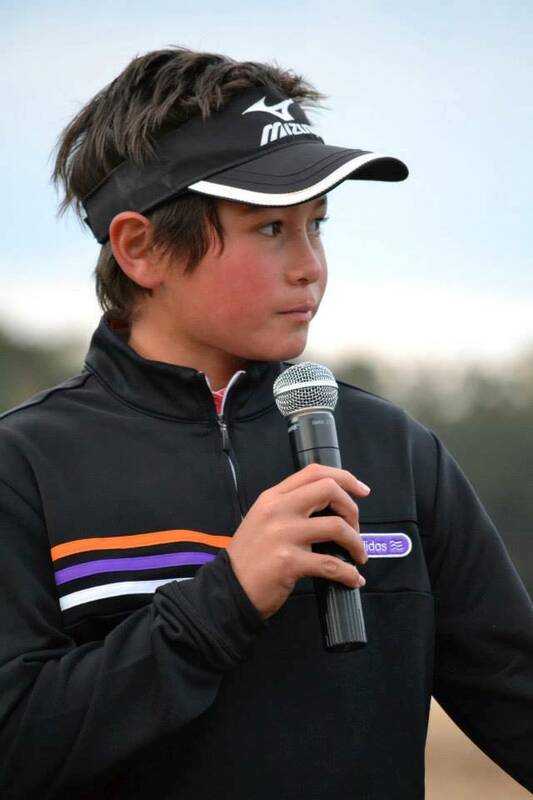 Day 2 saw the lead change and Karl finally catch that leader on the 17th hole to force him into a Play-off which Karl Par'd and the winner made Birdie on.Karl is just 13-years-old and has already won a High School event and now had two 2nd place finishes. The scoreboard is available here. 1st Round condensed highlights here. 1st Round- Back 9 complete here. 29th January 2015: Happy New Year everyone and our apologies for being absent this month. There are a couple of reasons for our absence. Firstly it is the middle of winter here so there aren't many tournaments at this time of year, plus secondly, we've been having some changes in that Karl is now living and training under my roof whilst we search for the best coaching fit. He is however, still at the same school. 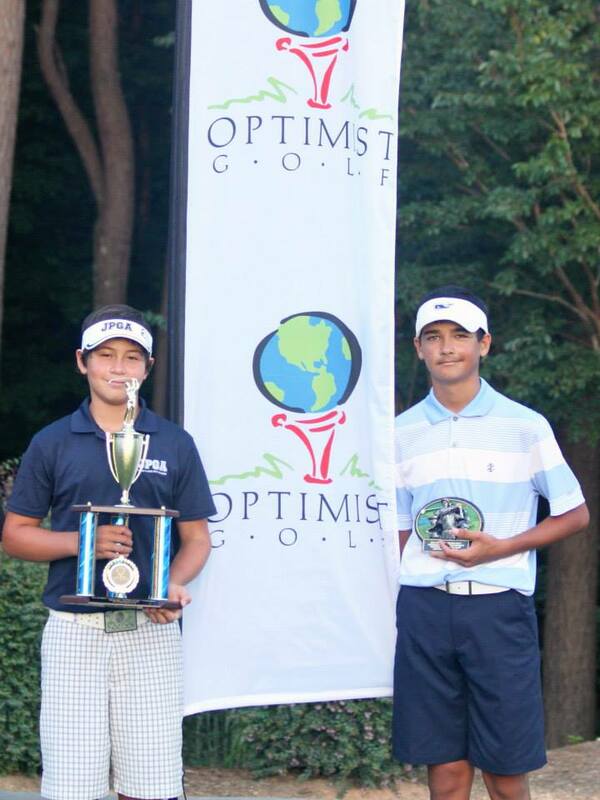 Karl did partner with friend Akshay Bhatia in a team event a few weeks ago in Pinehurst, but his first individual challenge comes this weekend at Pinehurst when he competes in the High School division of the Taheel Golf Tour's annual Major, the CCNC Junior Masters at the top-ranked Country Club of North Carolina. Being winter and tee'ing off in temperatures of around 32 degrees (Zero Celsius) which drastically affect ball carry, the yardages will be shortened to just 6590 Yards. You wil be able to keep up with Karl's progress by clicking here and selecting High School scores. During this quiet time, Karl's been making a lot of educational videos to help juniors through the eyes of a fellow junior which you can view here. 20th December: 12th place. Rounds of 73 & 76 on the as yet re-opened Gold Course at Trump Doral in Miami in a field of 80 sees Karl finish in 12th place. On the surface it sounds like he played just "OK", but a 10 on an early hole in the first round masked how well he actually played as he showed enormous heart to chalk up 6 Birdies in that round in an effort to get himself back into the tournament. 30th November: Win. 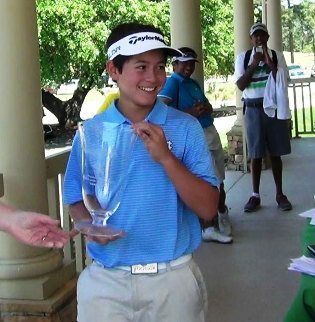 A 5-under 66 in the 2nd round which included a sizzling 6-under 30 on the Back Nine sees Karl (who at just 13 years and in Middle School) once again win the Freshman/Sophomore High School division, this time by 7 strokes. Some suggested that Karl's win in a smaller than usual field for both the Freshman/Sophomore and also the Overall High School a few weeks was a one-off. Karl answered those doubters in magical style and only just missed out on again winning the Overall title in this full field, coming a close 2nd. Ultimately he did indeed rue a poor first 9 in Saturday's round where he did not have a warm-up due to leaving his clubs behind at our host's house. 29th November (Saturday) : Freezing conditions greeted the players at the start of play, with the morning temperature dropping to just 23 degrees Faranheit (minus 5 Celsius), making for abnormally high scores, particulalry for the first few hour's play. Karl was 7-over for his first 9 holes, then knuckled down for just 1-over for the remainder of his round. He had missed out on his normal warm-up after he left his clubs at our host's house, leaving me to drive the 20-minutes back to get them and get back just a few minutes before Tee-off. 23rd November: 4th Place. A sound effort by Karl to battle driving rain and disregard his scores in the knowledge that other players were withdrawing at a rapid rate and that an awful scorecard could still win. In fact, 2 of his scheduled playing partners for the final round withdrew. 3 weeks ago his scheduled playing partner won the last tournament with 7-under. This tournament was won with a score of 14-over! The moral to this story for all players is to understand that you are always playing the course, and that as the conditions change so does the players ability to score. Despite his club flying out of his hands on multiple occasions resulting in a few awful holes, Karl hung in there and posted a score which was good enough for a Tie for 4th. Against 67 fine High School players aged 15-18, that's a good little effort and spoke highly of Karl's refusal to ever give up. 22nd November: Palmetto Dunes at Hilton Head Island, a George Fazio design, is the home for this weekend's tournament. As usual, 13-year-old Karl is playing up into the 15-18 years division. This weekend sees 65 players contesting that division after quite a few players withdrew (probably due to the weather). Winter is almost upon us and the weather this weekend is challenging the same players who, just 3 weeks ago, shot record low scores at a tournament at an adjacent course. After the 1st round Karl sits in a tie for 4th with one of America's best juniors, 18-year-old Bryson Nimmer (who got into the final 64 of this year's US Junior Amatuer, only to be taken out by fellow Melbourne junior Zach Murray, a member of Golf Australia's Junior squad). To check out the leaderboard, click here. 9th November: Win. 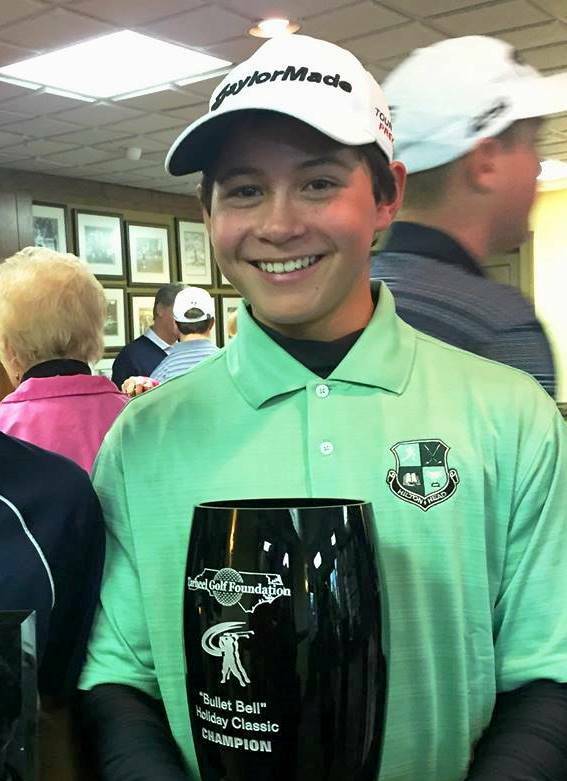 Karl wins both the Freshman/Sophomore High School division and also the Overall High School division at the Sanhills Fall Championship conducted at Pinehurst's Foxfire Resort by the Tarheel Golf Tour. On the 2nd round Karl also recorded a Hole-in-One, his 2nd in tournament play (the first one was at the 2009 Callaway Junior Worlds). You can view that Ace here. Round 1 Highlights are here, and Round 2 here. The Round 2 video includes the awards and interviews with Karl. The Tarheel Golf Tour's scoreboard also records the player's statistics during their round, so you see Karl's various stats by checking out his particular scorecard here, then just click on his name to see the detailed breakdown. Course: Foxfire Resort's "Grey Course", Pinehurst, North Carolina. 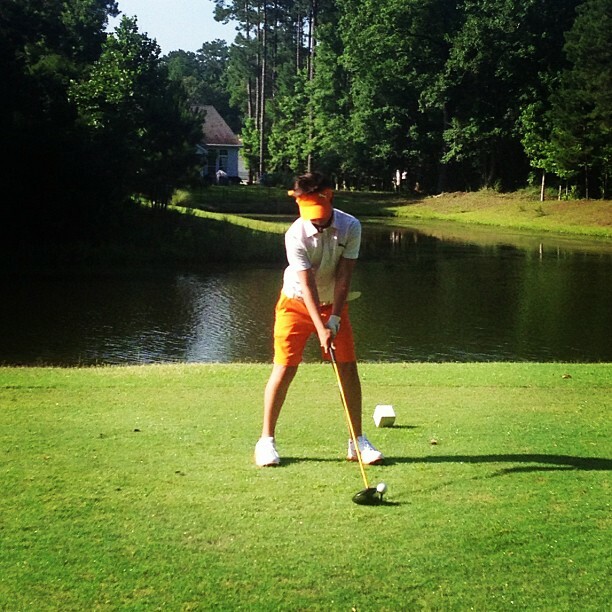 Tour: Tarheel Junior Golf Tour. Website here. 31st October: 5th Place. A weekend of golfer growth at North Carolina that money can't buy. Karl had a genuinely "off" day in the 1st round of the ACC Southerstern Fall Classic played at NC State University's Lonnie Poole Golf Course with a mixed bag 79. Feeling despondent after that 1st round we went to the range so that Karl could get himself back on track before the following day's play at a different course 30 miles away at Duke University's own course. He hit a large bucket of balls and focused particularly on his tempo, then followed that with an extensive period on the Greens to try to adjust to Duke's infamously treachorous Greens that demand that approach shots be left under the hole. It was lucky that Karl did get that practice in as his alarm failed to go off on Sunday morning , so with 30 minutes before his Tee time and a 15-minutes drive ahead to the course I awoke to Karl telling me that we had to get to the course ASAP. Karl managed to hit 5 balls on the range before a hasty Tee-off that resulted in a bogey on that starting hole. Instinct then kicked in and he rattled off 3 Birdies on the opening nine before adding another 2 on the back nine. 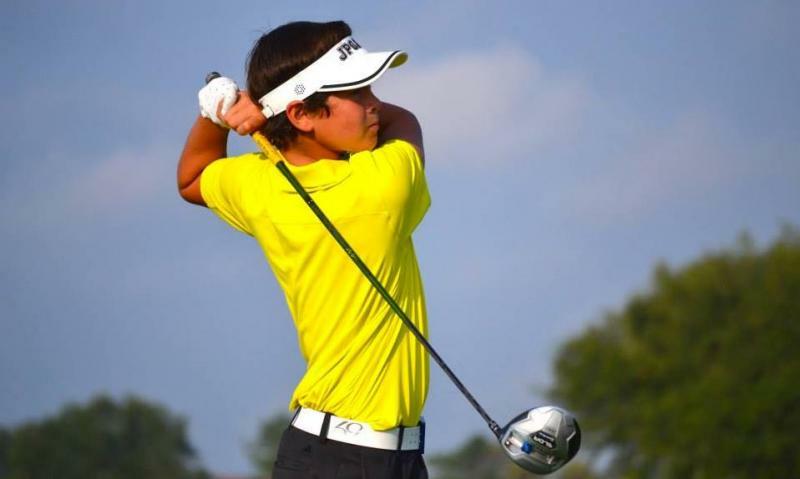 Karl's 2-over 74 was one of the lowest of the day on a day when scores were significantly higher than the 1st round's, resulting in him soaring up to 5th place in the 45-strong Freshman/Sophomore High School division. Next tournament we'll set both of our alarms though. Video highlights of the 2 rounds exlude the front nine of day 2 that saw 3 Birdies, but nevertheless we hope that it gives some indication of how Karl is striking the ball currently. That video is available here and the scores, complete with yardages, etc are here. 5th October: WIN. 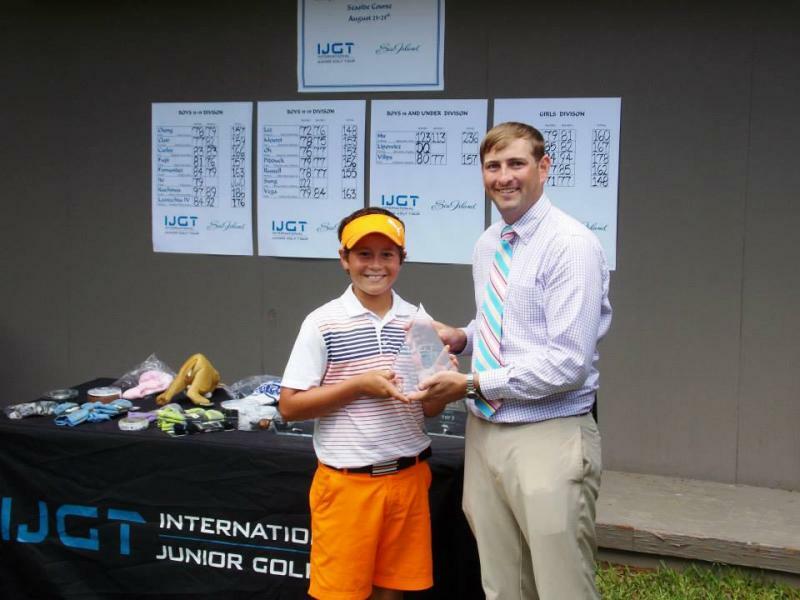 Karl breaks through for his maiden win (Tie actually) playing up in the Junior High School (typically 14-15 years of age) in the Tarheel Junior Golf Tour's Bridgestone Junior Championship at Grandover resort in North Carolina. 20th September: Is it possible for arch rivals to be friends in this, the most selfish of all sports? 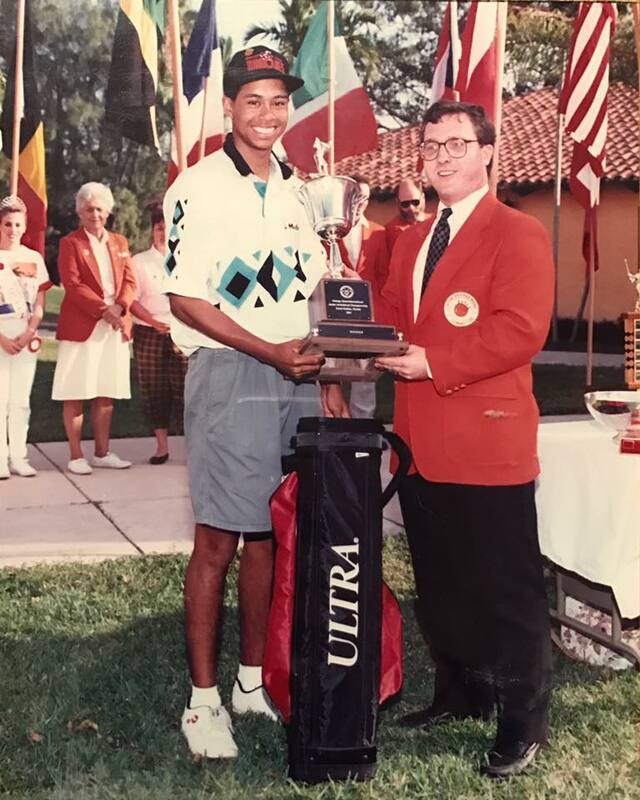 The players in this photo have accumulated 7 world titles since they were 6 years old yet are good friends off the course. 19th September: Karl's tournament schedule continues to be light one, with his next start coming on the weekend of the 27th. This is a good opportunity to discuss rankings, as it's quite a contentuous issue in junior golf after players reach 13 years of age. 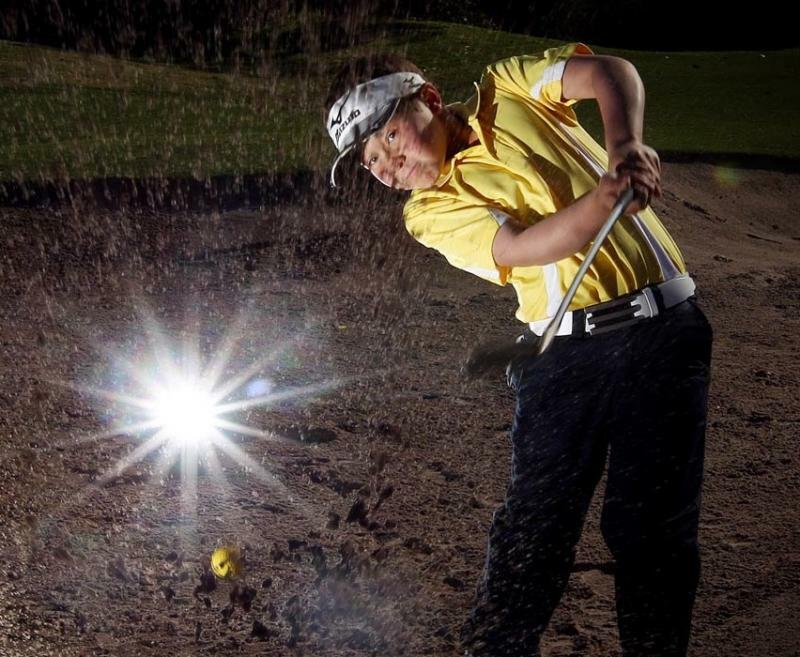 Many parents are obsessed with their childs national ranking and fly their child all over the country at massive expense, turning golf at this age into a battle of the bank accounts. We can't even consider that, so Karl sits back in the rankings compared to some of those players whom he beats convincingly at the world championships. That Karl attends school and learns to socially interact with people. Does this sound strange to you? Do some research of your own and you'll see a lot of examples of kids of Karl's age who are home-schooled at the age of 13 and who lack social skills as a result. That Karl doesn't "burn out" at a young age. He plays no more than 2 tournaments a month. For a top-ranked junior, that is not many tournaments. That he continues to love the game. 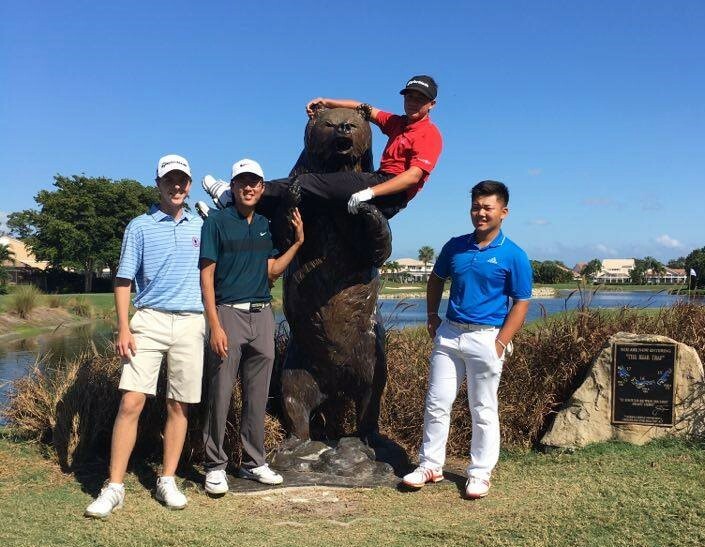 7th September: Karl had a "bad day at the office" in his 2nd round of the Golden Bear Junior Challenge last weekend with an 80, despite the boys having played from 6850 yards. We see it with tour players such as Rory where they shoot well one great round and then shoot a shocker the next round. It's good to see that Karl's got company with this anomaly, but at least he doesn't have those rounds during Major Championships. It's at this stage of the season that Karl works on swing modifications and it takes weeks and months for those changes to become "natural", so we weren't expecting too much from in this tournament. 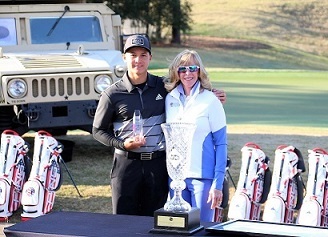 The reason for playing Karl up was that his age group didn't have enough players (20 is required) for the AJGA to have been awarding a Performance Star to the winner. Additionally, it was a good opportunity to give him a run with the big boys and (at least on the 1st round) he showed that the extra yardage isn't an issue, being able to reach all the Par 4's with ease and barely being short on getting to the Par 5's on a slow course that provided very little run out on Drives. Karl's medium term goal is to qualify next year for the US Junior Amateur, and now that he feels that the extra yardage won't be an issue, he's filled with confidence heading forward towards next year's Major goal. Karl is spending this week with coach David Goolsby reinforcing those swing modifications and we'd expect to see a lot more consistency in coming tournaments. We managed to get quite a bit of the 1st round on video here and we also complied a short game highlights video which you can view here. 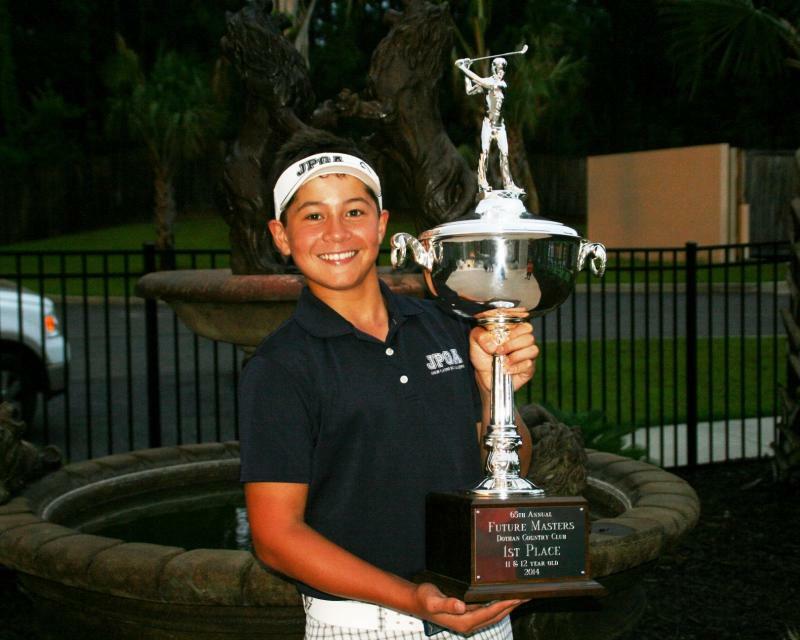 6th September: Karl opens with a 2-over Par 74 in the 15-18 years division of the Golden Bear Junior Challenge played over 6850 yards at the Golden Bear Golf Clun here in Hilton Head to sit in 3rd place, just a shot behind the leaders. This follows a good tournament last weekend where Karl played in the Junior High School division of the Tarheel Junior Golf Tour's Robert Trent Jones (Snr) Junior Championship at tplayed on the magnificent Carolina Trace GC in North Carolin where he came back from a week of having influenza and recorded rounds of 79 & 72 to finish 3rd there. 16th August: Karl turns 13 today! We've had a busy few weeks and for the first time in 5 years I was simply unable to keep up with things due to quite a lot of extraneous stuff that's been going on. We'll have some important news next week. 18th July: Win! Karl wins the Junior Worlds after making up a 3-shot overnight deficit and then making Birdie on the 1st Play-off hole. His round was bogey-free. This is Karl's 4th World Title and he is 12 year's old. At 12-years of age Tiger had 2 world titles to his name and then won again at ages 13, 14 & 16. The full scorecard is available by clicking here. 17th July: 7am. Karl will Tee off at 1.25pm today in an attempt to go 2 ahead of Tiger's world title record at the same age. He'll start 3-shots back on a course which can change a player's scorecard in the blink of an eye. In the 2012 championship Karl started 3 shots back and won by 3. Whatever happens today however, the winner will be a worthy one. The Leaderboard is available by clicking here. Video highlights of Karl's short game from the 1st Round are available here and video clips from the 2nd round are available here and here. We are running desperately short of funds for the next leg of the trip, so if you are able to contribute at all, please refer to the PayPal button locared above. 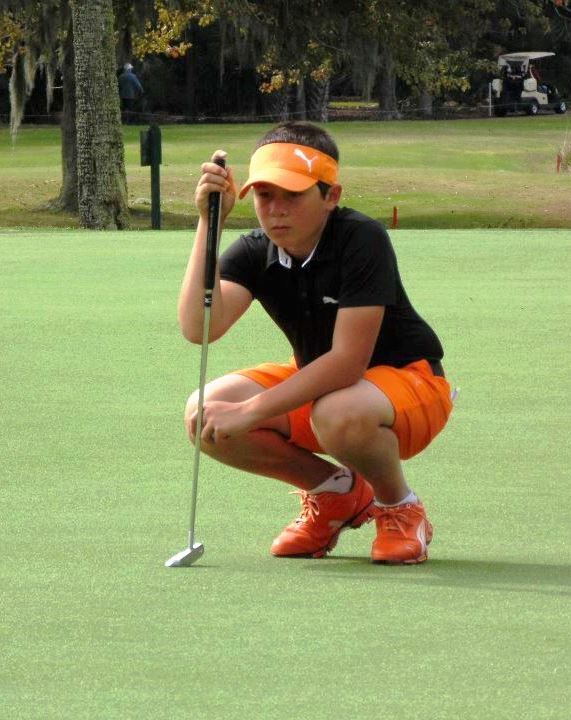 15th July: Karl sits in 4th place at the Junior Worlds after opening his account with a 3-under 69. 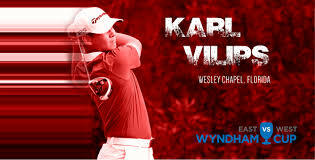 An uncharacteristically bad day from the Tee saw Karl playing from parts of the course we'd not previously experienced. However, his short game came through for him and he notched up 5 Birdies to offset the 2 Bogies for a reasonable score and to place him in the mix. To see the full scores, click on the Leaderboard here. 10th July: The Callaway Junior Worlds start on Tuesday next week. The tee times have not been released as yet, but the leaderboard will be available at http://jwgc.bluegolf.com/bluegolf/jwgc14/event/jwgc141/contest/12/leaderboard.htm. 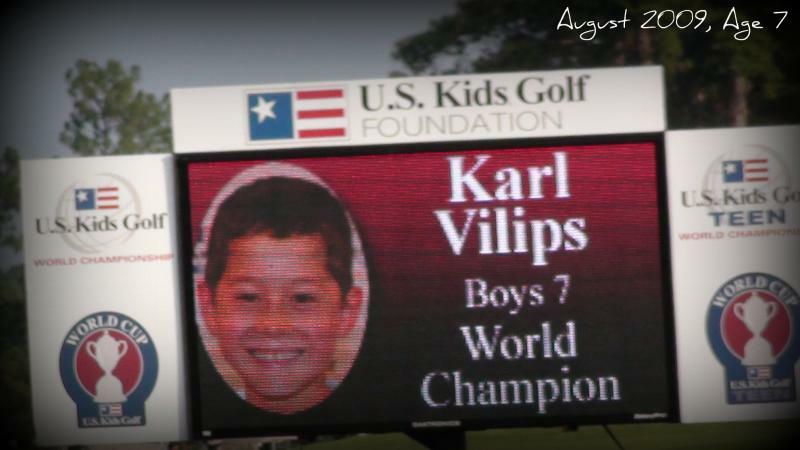 * Karl's age division at the Callaway Junior Worlds is the 11-12's. This year he competes as a 12-year-old. Last year he competed at age 11 and finished 14th. Interestingly, in the previous 9-10 years division his 2 results were 13th at age 9 and 1st at age 10. The quality of the competitors is the absolute best, so Karl has been preparing accordingly. 25th June: Win. 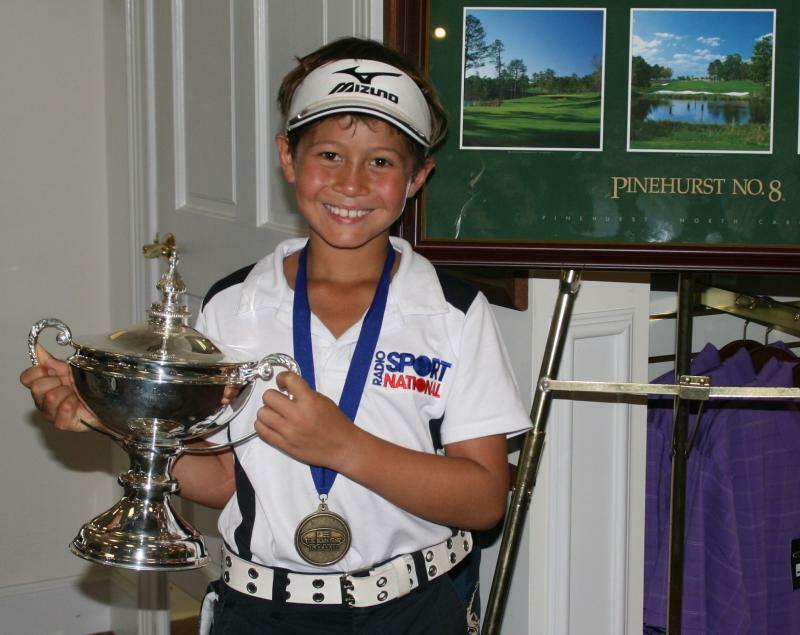 Karl wins one of junior golf's most prestigious and sought after titles, the 11-12 year division of the Future Masters at Dothan Alabama. This tournament has seen numerous Major winners and countless PGA Tour players compete for the title in its 65-year history, so it was rewarding to see his name added to the list with one of the lowest scores on record. Karl had built up a 4-stroke lead with 5 holes to play but a deviation from his game plan cost him his only double bogey of the tournament on hole 14. Going into the 18th he held a 1-shot lead but again deviated from his game plan and found the face of a fairway bunker 131 yards out. The other players are the best for their age so Karl decided to take on the bunker lip instead of trying to salvage a Par. His draw 9-iron finished 3 feet from the Cup and lead to a Birdie and a 2-stroke win. I caught the shot on video from near the Green, whilst the TV crew caught the shot from behind Karl, so take a look via the links below for some great media coverage and also see how much better Karl is handling media interviews nowadays. 15th June: US Open report. What a great week up in Pinehurst for the 2014 and thanks to our friends for putting us up and finding us tickets to each day's practice and play- we couldn't have done it without you all. On our way out of town this morning we bumped into Matin Kaymer who was kind enough to leave his coffee long enough to do a brief interview with fellow Taylormade player Karl. That video can be viewed here. 13th June: With a month before a series of tournaments which feature the Callaway Junior Worlds, The Optimist International and the US Kids Worlds, Karl's taking a break this week from play & practice and has been in Pinehurst watching the US Open. 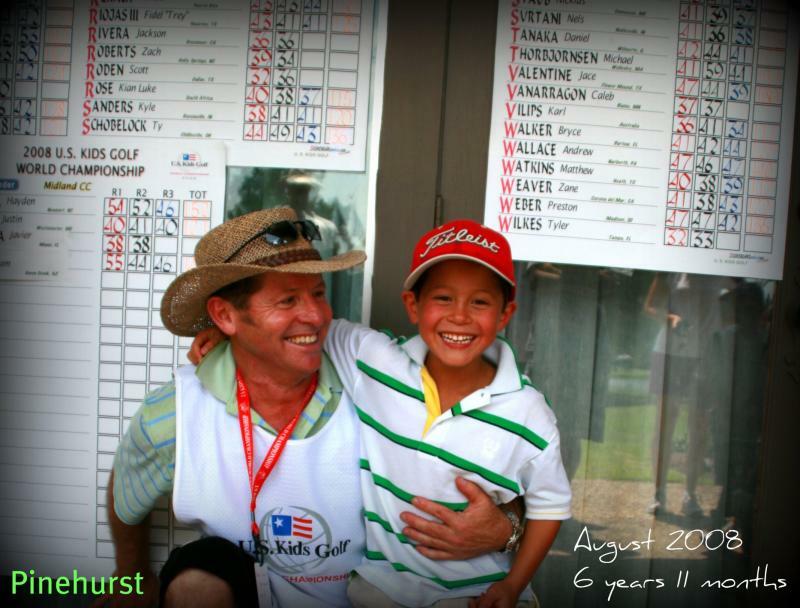 Karl's only played one tournament at Pinehurst #2 back when he was 7-years-old (for the Win), but with the US Open on this week we're reflecting on a round he had there with friends in August 2012 after the recent renovations. That round can be viewed by simply clicking here. 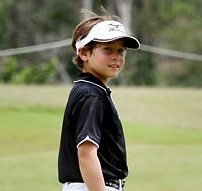 Karl's back in action next week at a Drive, Chip & Putt qualifier, followed a few days later by the Future Masters in Alabama. 10th June: Win. 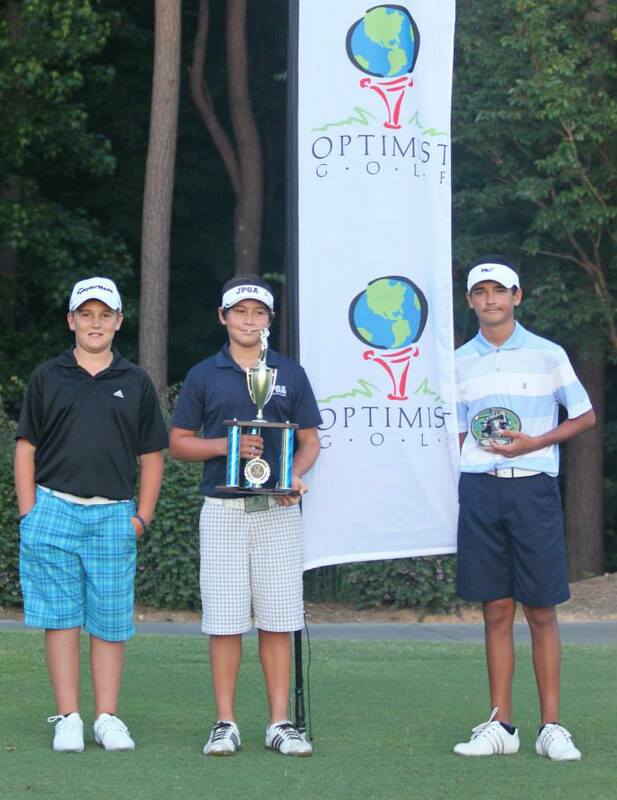 Karl wins the Georgia Qualifier for the 2014 Optimists International conducted over 2 days at the Bridgemill Athletic Club in Georgia with rounds of 73 & 68. Karl didn't have an opportunity of a practice round so played the first round without any knowledge of the hilly course and recorded a solid 1-over 73. On Day 2 he knew where his landing points off the Tee would be and proceeded to compile a top-notch 4-under 68. The official scores are not publised as of writing, but we've uploaded the video of the 1st and 2nd rounds here. 31st May: Karl's "What's in the bag" video is now uploaded and can be viewed here. On other news- well, there is none. Karl's not played any golf this week at all after having a bit of a niggle in his fingers in last weekend's final round. We'll see how it is on Monday. 20th May: Back-to-back 7-under 65's top off a remarkable weekend for Karl and a 7-shot win on the Tom Fazio designed Finley GC at UNC (University of North Carolina). What's more, he left quite a few out there due to entering unchartered territory for him. 18th May: New Personal Best. Karl shoots a 7-under 65 in the 1st Round of the University of North Carolina Tarheel Junior Championships. The university's course was designed by Tom Fazio and is, quite simply, an absolute delight. 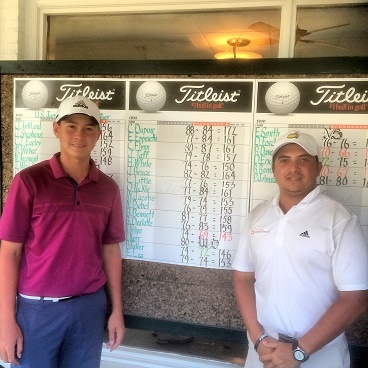 Karl is a player who responds to a challenge and last weekend his good buddy Scott Roden shot a 65 in Texas. Karl made it clear before today's round that his goal was to go 1 better than his own PB and shoot a 65 as well, and that he did, with only 26 Putts. The scorecard can be found here. Round 2 is tomorrow with fellow world title contender and Akshay Bhatia hot on Karl's heels after a 68 of his own. Akshay attempted to qualify for the US Open last week and did everybody proud with his effort. View the majority of Karl's round here. 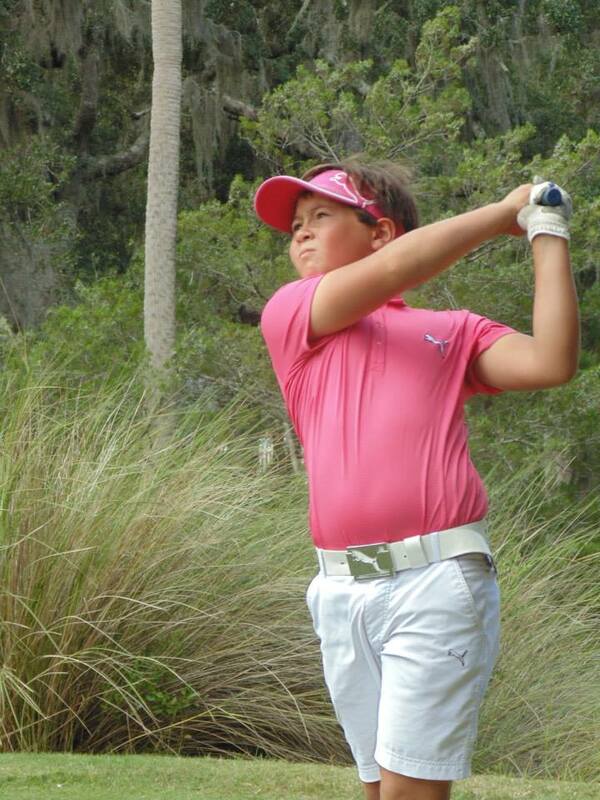 13th May: Karl finishes the season atop of the IJGT 14 & Under Tour rankings. The rankings can be viewed here. He will receive 2 AJGA Performance Stars for the result and be competing in the IJGT Tournament of Champions in 2 weeks time down in Florida. 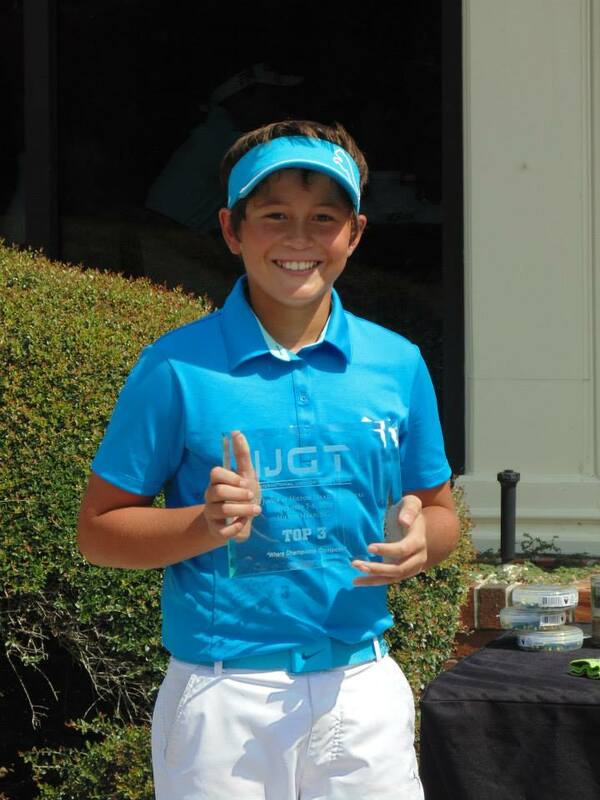 4th May: WIN: Karl shoots round of 70 & 70 to win the Tarheel Junior Golf Tour's Foxfire Junior Championship at the Foxfire Resort in Pinehurst, North Carolina. Steady golf is the best way of describing Karl's result. Moreover is his consistent scoring of late, with Karl going under Par in yet another tournament. 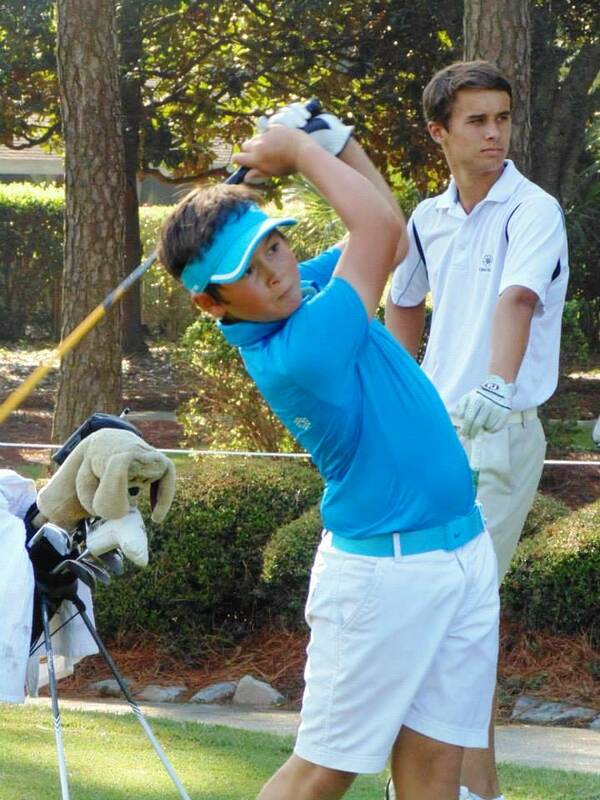 The Tarheel Junior Golf Tour in North Carolina is a breath of fresh air for junior golf. 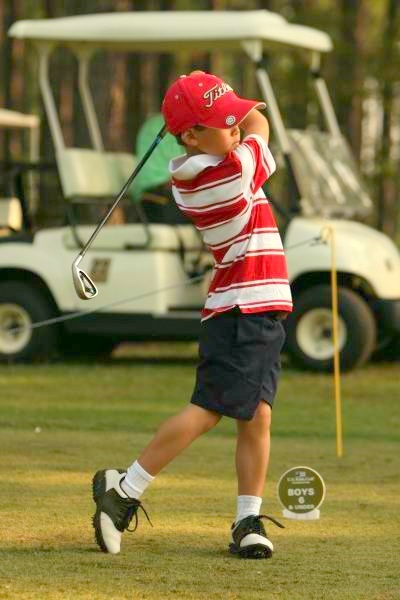 It's run by parents of successful junior golfers who figured out how both parents and players want a junior tournament run. Karl's age division has 2 of the top-10 12-year-olds in the world playing in almost every tournament, so a win here is a worthy result. If you live in this region, take a moment to check out their tour attheir website. It'll take a day or so for us to get the video of the weekend uploaded onto YouTube, but in the meantime, check out the Leaderboard here, video of the Awards ceremony here and of the 1st Roundhere. 29th April: 2nd place. 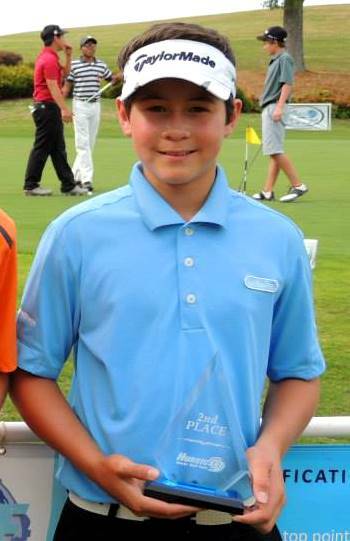 Karl finishes 2nd by just the 1 stroke in his first Hurricane Junior Golf Tour Event held at Traditions of Braselton Golf Club in Braselton, Georgia. Karl's putting over the 2 days was simply outstanding, helping keep himself in the game. He had been having a few minor swing modifications worked on in the preceding days and hadn't quite gotten the concept, causing him to miss a large percentage of Greens in regulation. However, Karl's always taken comfort in not having any weakness in his game and his Putting stepped up to the plate to support the missed GIR tally, as did a few very good chips, one of which went in. The co-leader and Karl got locked into a virtual Match Play situation going Birdie for Birdie on many holes, with his 3-under effort eventually pipping Karl by a single stroke. The 3 boys in the final group had a great experience together with all 3 playing top golf and enjoying each other's company. 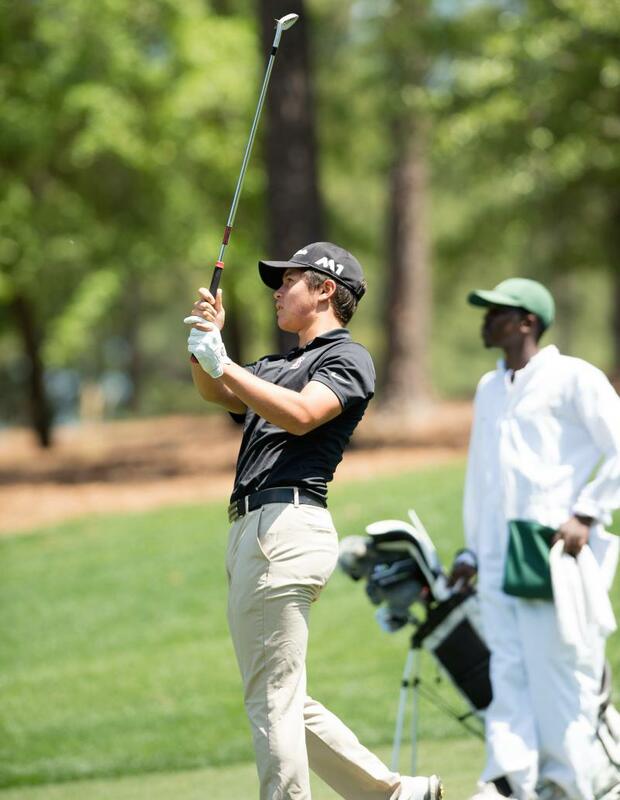 21st April: After missing out on qualifying for the AJGA event in Georgia, Karl headed north to North Carolina and Duke University where he Tee'd it up in his 2nd Tarheel Junior Golf Tourevent. 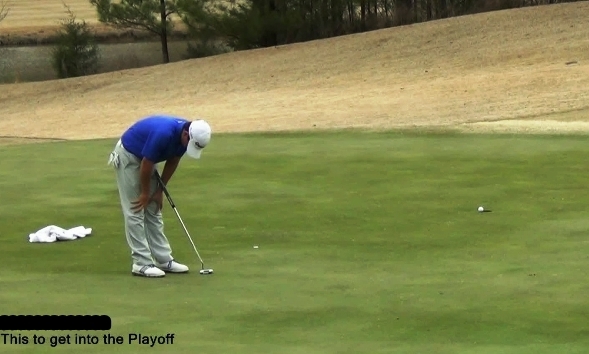 For the first time after this year's coldest winter on record the players got to putt on pure Greens at Duke. The Champions Bermuda Greens allowed the players to get back to "Stroking" their Putts and the result was a return of Putting confidence. The Duke layout was designed by Robert Trent Jones (Snr) and featured undulating Fairways and Greens which demanded local knowledge. Karl shot an Even Par round to sit in 3rd place in the Middle School (12-14 years) division but didn't get a chance to play catch-up after the 2nd day's play was abandonded following heavy overnight rain which rendered the 2nd day's course at the University of North Carolina's Finley Golf Course unplayable. We managed to get video form that 1st round which can be viewed here. Additionally, the full results, yardages, etc are available here. Only 9 players qualify to get into the event itself and Karl missed out by a stroke on having a chance to get in with a round of 77 played off 6600 yards. 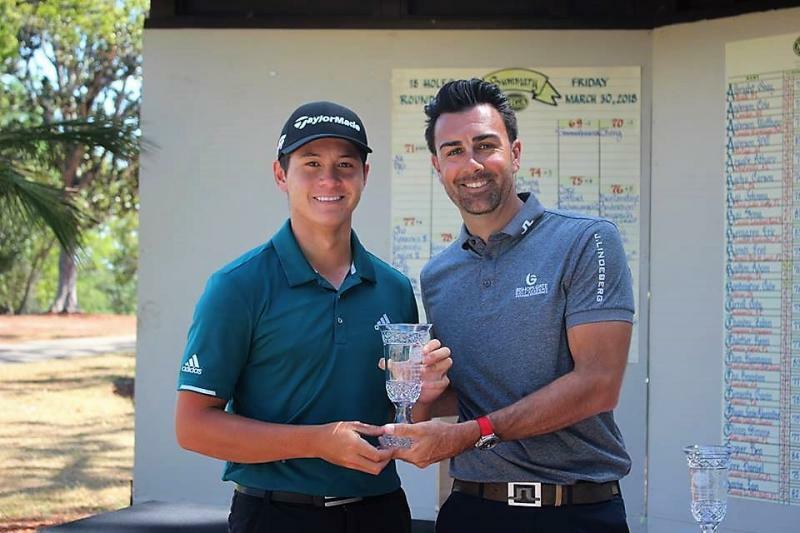 In actual fact Karl does not need to qualify for these tournaments by virtue of him having acrued a lot of AJGA "Performance Stars" in other prestigious tournaments, but finances didn't permit us to get his entry fee in on time for that, meaning that he had to attempt to get in via the Qualifier. However, by finishing in the top 20% of the Qualifying field he was awarded an additional 2 Performance Stars. Karl will need to get a supportive benefactor to come forward and ensure that he doesn't miss out on playing in these events in the future, so if you are interested in assisting, please let us know. Our email is pauls@westnet.com.au. Karl's play from Tee to Green was good but his putter wasn't cooperating this day. Full results for this qualifier are availble here. 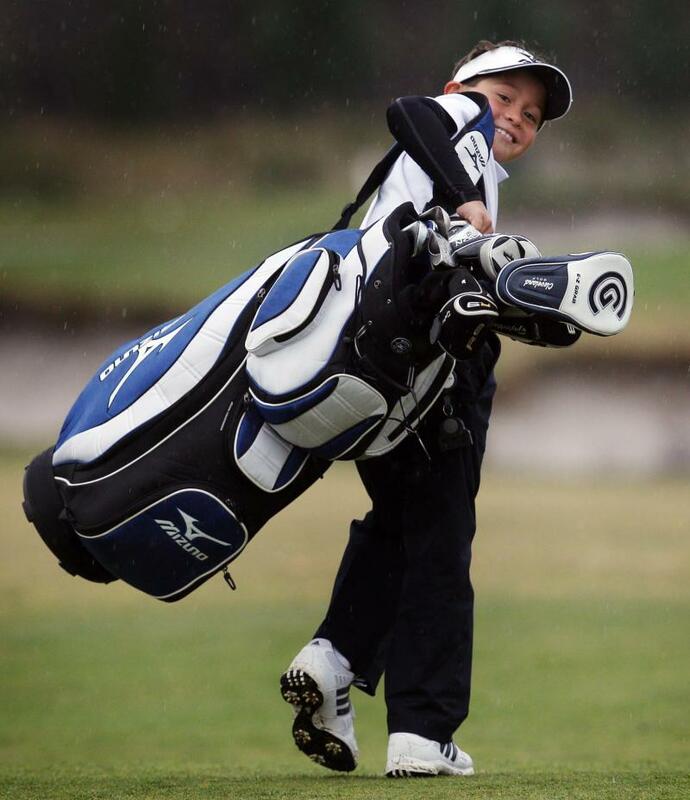 13th April: Karl finishes 2nd by a stroke in the Bridgestone Junior Golf Championship run by the Tarheel Junior Golf Tour which was played at The Grandover Resort in Greensboro, North Carolina. The course was similar to last week's course at Chateau Elan in that numerous creeks and streams cut across fairways, making Karl use far less than Driver on many holes. 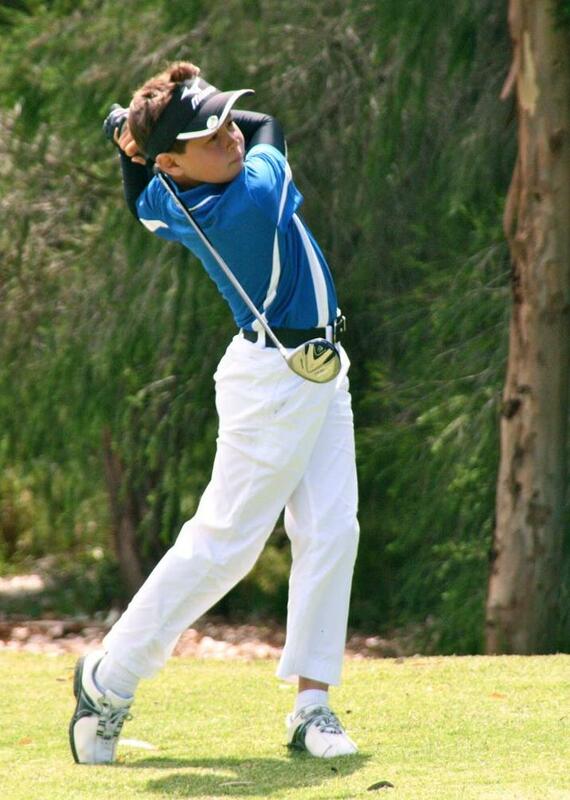 He played in the Middle School division which is primarily for boys aged 12-14 years with rounds of 71 & 72. Overall, Karl's play was strong but his short game was uncharacteristically "average" this weekend. By that, we mean that his proximity to the flag was outside of his normal range. The field had the best juniors from the Carolinas region, so this was a great opportunity to see which areas of Karl's game need some extra attention. His driving and irons were great, but as mentioned, he'll be wishing that his short game had been a little better. 7th April: 3rd. 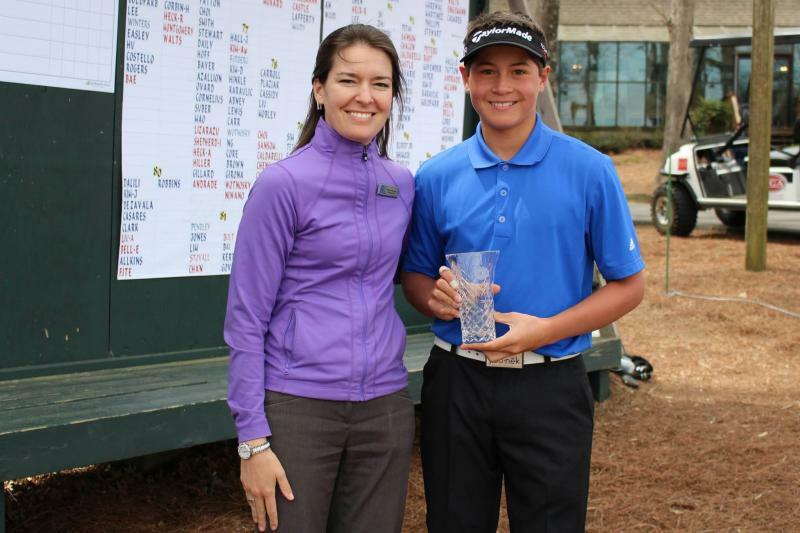 Karl shoots 78 & 67 to finish 3rd in the 12-13 Years Boys division at the Junior Masters by PGA Superstrore conducted at Chateau Elan in Georgia. On the way there we drove past Augusta National. We mistakingly drove into Magnolia Lane, only to have the security Guard chasing us to advise me of my complete lack of eyesite for not having seen the sign which read 'This entrance for Players & Members only". How embarrasing, but we'll look back in years to come and have a good chuckle about it. So, back to this tournament. Followers of Karl would have noticed from his last tournament that he's developed a Bubba watson like front foot drag on his Drives, so our emphasis this past 2 weeks has been to correct that. Saturday's round still had remnants of that front foot drag and a round of 78 was the result. However, on Sunday Karl made a concerted effort to get his weight transfer through and to thereby have that front foot remain quiet. The result- a tournament low across all age divisions of 67 and just 3 shots short of a win. All players struggled with the Greens which haven't recovered since coring due to the coldest weather on record, so plenty of putts from all players were missing the hole from relatively short distances. That condition applied to all competitors, so no competitior was disadvantaged more than any other. That's golf and we just have to deal with it the best we can. Congratulations go out to the organisers for putting together a great event. The results are available here and click here to view video of the 2nd round.